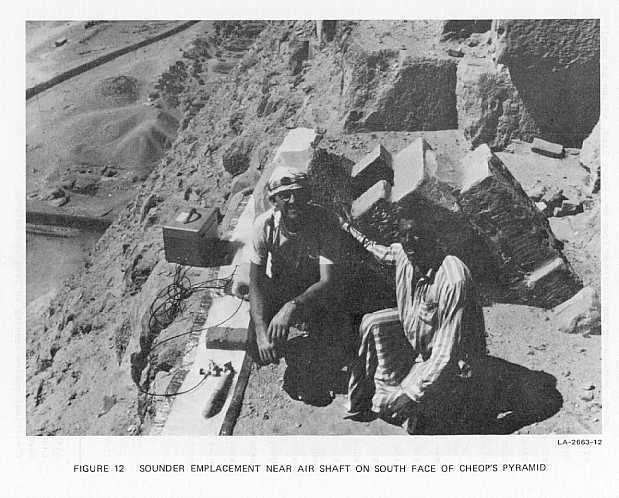 A Joint Egyptian-American research team conducted electromagnetic sounder experiments during autumn 1974 with the primary objective of locating archaeologically significant chambers in the Giza area. Radio-frequency losses in the limestone rock of the area, ranging from 6 dB/m at 10 MHz to 25 dB/m at 150 MHz, appear to preclude much practical application of radio-frequency sounding in the vicinity of Giza. The high losses are contrary to expectations based on samples analyzed before the Giza experiments, but are consistent with later laboratory analyses made at the high temperature and high humidity characteristic of the Giza environment. Exploration of the pyramids in conjunction with the experiments yielded two additional discoveries of interest. 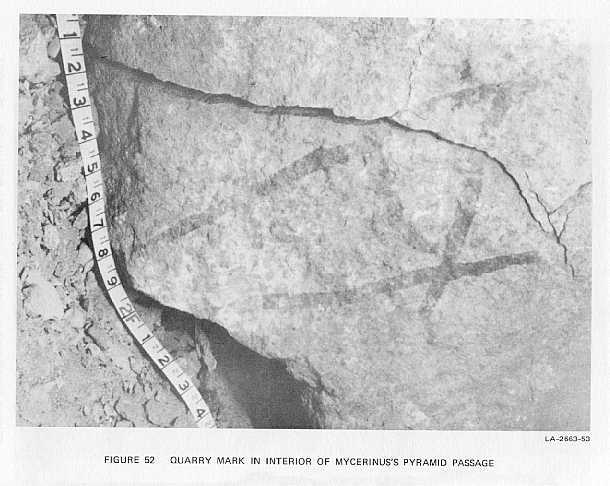 A number of quarry marks and what appear to be alignment markings which may have been used during pyramid construction were located in the excavation on the north side of Mycerinus' pyramid. Observation of construction practices made visible by the digging efforts in various forced entrances disclose a much more common use of irregular blocks and debris fill, particularly in Chephren's and Mycerinus' pyramids, than is commonly appreciated. These construction practices may have a significant bearing on the design of future sounding experiments. This work was sponsored by the National Science Foundation, Office of International Programs, under Grant No. GF-38767. We are especially grateful for this grant and the tireless efforts of Mr. Selim Selcuk in completing necessary international arrangements and plans on our behalf. Prominent and impressive as they are, the pyramids of Giza on the outskirts of Cairo (Figure 1) have aroused curiosity and provoked imaginative speculation in every generation for the more than 4500 years since they were built in the Fourth Dynasty of one of the world's most ancient and long-lived civilizations. Yet the sheer bulk and high degree of preservation of these ancient monuments have prevented a thorough archaeological exploration of their interiors. Significant portions of the Giza necropolis remain unexplored, as well. Only in recent years was the rubble cleared away around the base of the First Pyramid, resulting in the discovery in 1954 of two magnificent funerary boats belonging to Cheops, builder of the "Great" Pyramid of Giza.1* The pavement surrounding the Second Pyramid, that of one of Cheops' son, Chephren, though mostly cleared, has not been completely searched for subterranean chambers such as storerooms or boat pits,2* and clearing the rubble surrounding the Third Pyramid, that of Mycerinus, has begun only in the last few years. Excavating the pyramids by drilling or tunneling in search of hidden chambers or passageways is an unacceptable desecration of the monuments; yet the discovery of a hidden intact tomb at Giza could easily be one of the greatest archaeological finds of our century. A lesser discovery such as an intact boat of Chephren or Mycerinus would still be a find of enormous significance in Egyptology. 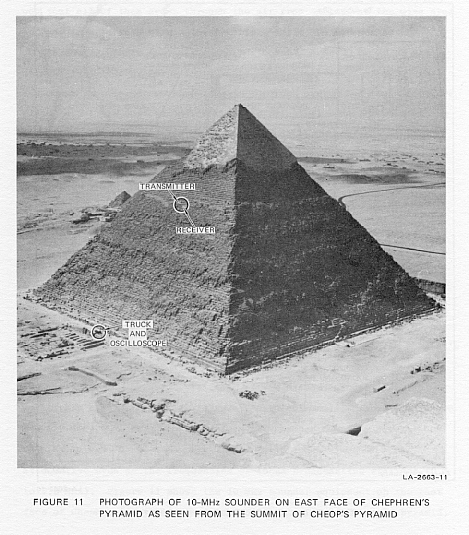 Following his first visit to the pyramids in 1962,3 Professor Luis Alvarez of the University of California at Berkeley, inspired by the possibilities of finding hidden chambers in the pyramids (especially the second pyramid, which contains only two significant known chambers), realized that measurement of cosmic ray flux from within a known chamber of a pyramid could give information about cavities or voids elsewhere in the main body of the pyramid. 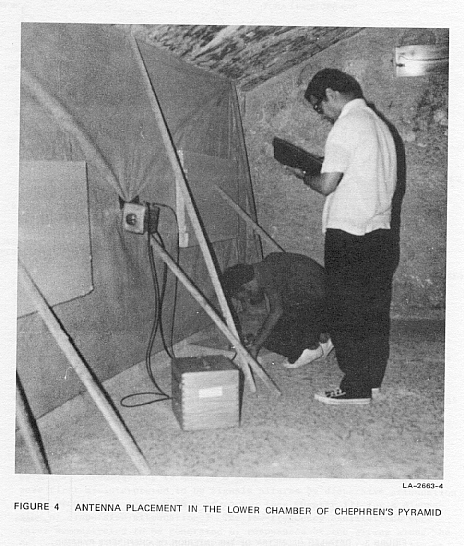 After lengthy preparation and much effort by a joint team of scientists from the University of California and Ain Shams University working in cooperation with the Organization of Antiquities, data collection on cosmic ray flux through the pyramid walls began in mid-1967 in Belzoni's chamber. Results of the first experiments indicated that within a vertically oriented cone 35 degrees in half-angle, no unknown chambers were to be found in Chephren's pyramid. 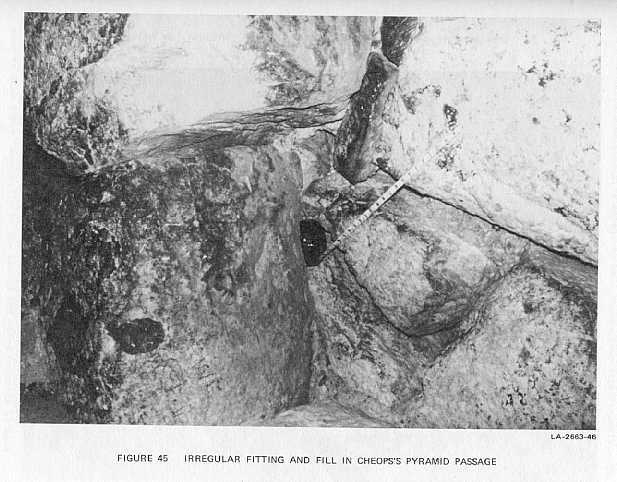 The volume initially surveyed was about 19 percent of the total volume of the pyramid.4 Subsequent measurements at low angles showed beyond reasonable doubt that no chamber existed in the remaining portions of the pyramid above the underlying bedrock.5 Proof that the cosmic ray method was successful in "X-raying" the pyramid was the successful detection of both the Tura limestone cap on Chephren's pyramid and the "shadow" cast by the pyramid of Cheops when the cosmic ray detector was pointed north-east at a low angle in the direction of the Great Pyramid. While such negative results are disappointing, because no additional chambers were found, the cosmic ray experiments scientifically were unique and elegant. Furthermore, they were accomplished without disturbing the pyramid in any way. The principal limitation of the method is inability to detect unknown chambers beneath the pyramid. A chamber very close to Belzoni's chamber could escape detection by this method as well. While the experiment could now be repeated in other pyramids such as Cheops', greater problems in data interpretation are expected because of the three large known chambers and the grand gallery in that structure, and multiple chambers in most other pyramids as well. Even under favorable conditions, RF losses in most rocks near the earth's surface are high and increase with increasing frequency rapidly enough that only relatively low probing frequencies (HF-VHF) are usually appropriate. 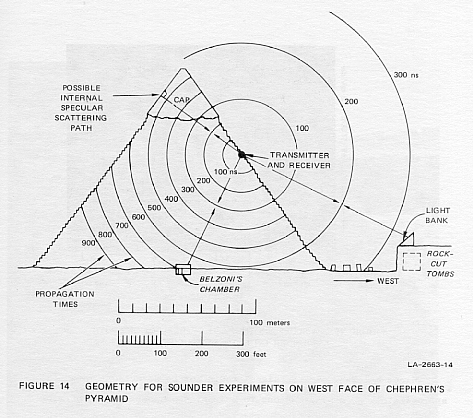 Since resolving power (the ability to delineate a chamber using a given probing wavelength) is poor for wavelengths much longer than the chamber dimensions, there are also lower limits on the frequency for such sounders, apart from practical considerations of antenna size and equipment portability. These considerations led to development by SRI of a family of pulse-echo sounders operating in the frequency range 10 to 150 MHz. 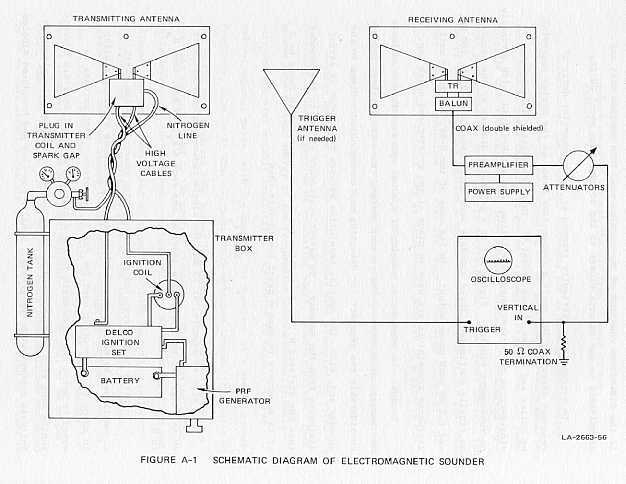 A second set of constraints, related to the need to detect chambers relatively close-in to receiver and transmitter, required a radio-frequency pulse extraordinarily short compared to that used, for example, by radar. In fact, a pulse length only one or two RF cycles in length is about optimum for most underground electromagnetic probing applications. 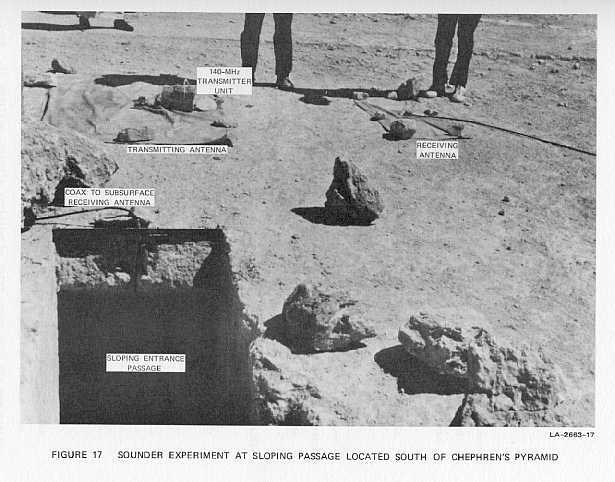 During the development of sounder equipment suitable for use at the pyramids, a number of potential test sites in California were studied. RF losses at most prospective sites were found to be prohibitively high, as expected; however, a dolomite mine, owned by Premier Resources, Inc., at Lone Pine, California, in the Inyo Mountains east of the Sierra Nevadas, provided a suitable test bed.6 Chambers in the mine 100 ft to 150 ft beneath the sounder transmitter and receiver located on the surface were readily detected through the dolomite rock surrounding the mine workings, establishing the basic credibility of the sounder technique. 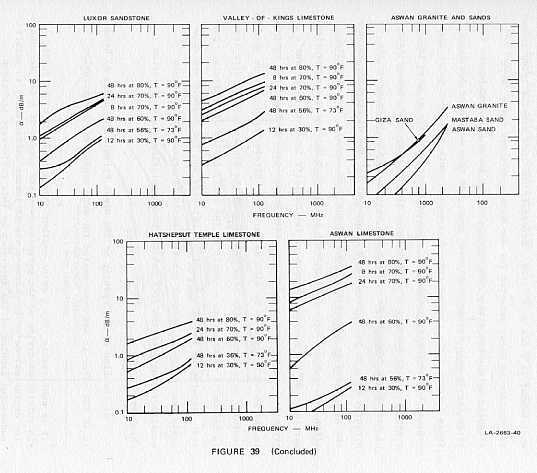 On the strength of these successful feasibility experiments, the SRI group proposed field experiments at Giza in Egypt to the National Science Foundation in early 1973. Further impetus was added when two out of three small fresh samples of limestone from Chephren's pyramid showed electrical properties apparently favorable enough to permit probing the pyramids by radio waves. The third sample of pyramid limestone (believed to be casing stone) exhibited high losses. 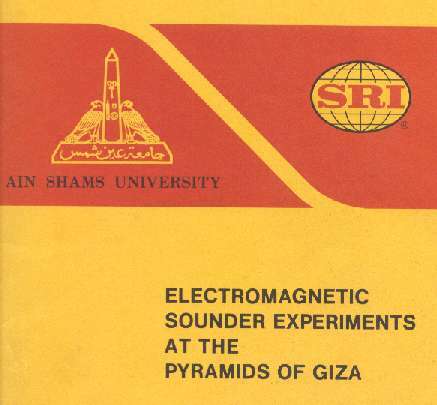 The field experiments described in this report were subsequently conducted in Egypt by a joint Egyptian-American team during the fall of 1974 using the short-pulse electromagnetic sounder equipment developed by SRI specifically for this purpose. Further details on the equipment as finally configured are given in Appendix A. Appendix B discusses the propagation of electromagnetic waves in rock, and Appendix C gives a mineralogical description of two samples of Giza limestone. This chapter presents a detailed account of the actual experiments conducted at Giza in the fall of 1974 by the joint Egyptian-SRI team. During the seven-day period that preceded the arrival of the electromagnetic sounder equipment from the United States, the six members of the American team met daily with the six Egyptian team members for discussions on propagation theory, equipment parameters, and priority of field experiments. All soon agreed that establishment of actual in situ one-way losses in both bedrock and the body of Chephren's pyramid should be established first of all, since every proposed experiment depended upon knowledge of propagation parameters in the rock. 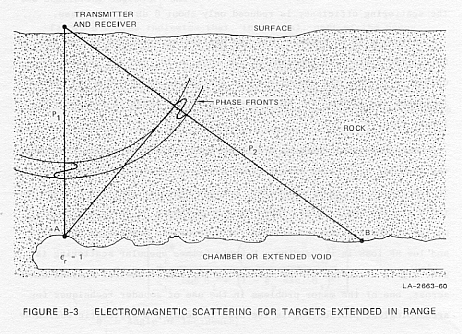 Since in a one-way propagation experiment it is relatively easy to add a third antenna, it was decided to set up the sounder for simultaneous two-way propagation and one-way propagation experiments (1) between the lower chamber and Belzoni's chamber in the bedrock beneath Chephren's pyramid, and (2) between Belzoni's chamber and a point about half-way up the north face of Chephren's pyramid. 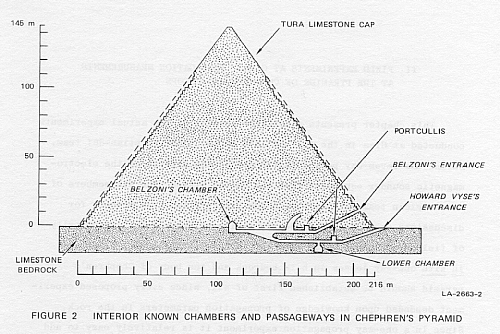 Figure 2 shows the interior known chambers and passageways in Chephren's pyramid, while Figure 3 gives details of the geometry for propagation between the interior chambers. Field experiments began September 27, 1974 within the second pyramid. Transmitting and receiving antennas were emplaced against the south wall of the lower chamber so that energy could be propagated through bedrock in the direction of Belzoni's chamber 68 m away. 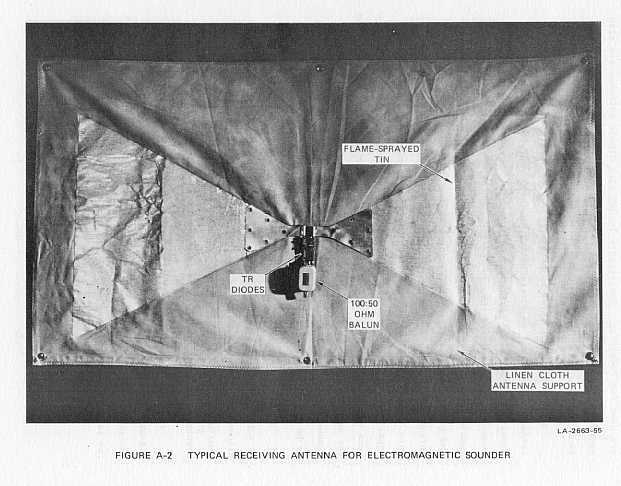 Blocks of styrofoam sheeting and lengths of light lumber were used to prop the metallized cloth antennas tightly against the rock walls of the chamber* (Figure 4). A second receiving antenna was similarly mounted on the wall of Belzoni's chamber (Figure 5) to receive the one-way energy through the rock. 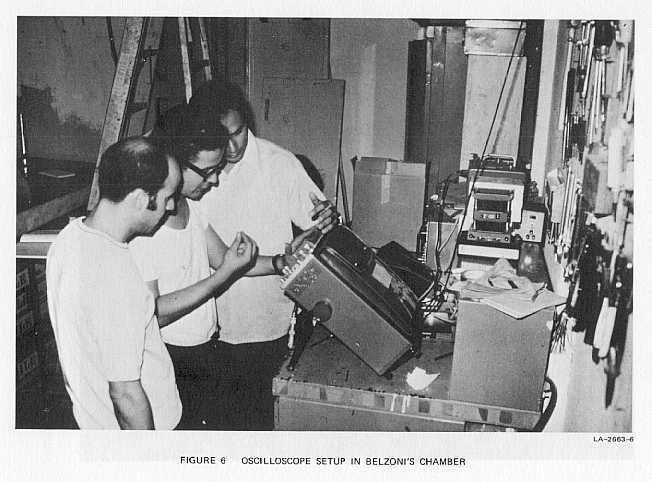 The receiving oscilloscope and camera were placed in the cosmic ray experiment enclosure in Belzoni's chamber (Figure 6). Lengths of double-shielded coaxial cable (RG 9/U) connected the receiving antenna in the lower chamber to Channel 1 of the oscilloscope, and the antenna in Belzoni's chamber to Channel 2 of the oscilloscope. 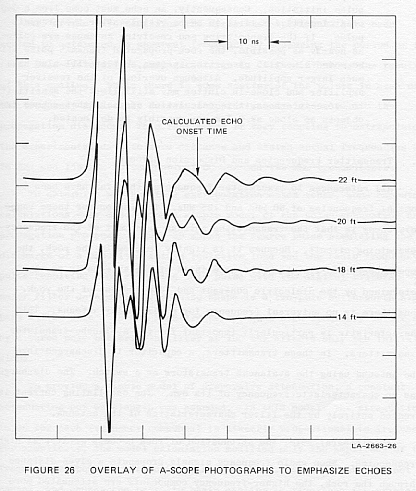 Since qualitative observation of the received signals appearing on the oscilloscope suggested that they were occurring with approximately the right time delays and amplitude characteristics, it was assumed that signals were indeed propagating through the rock both one-way and two-way. Therefore, a number of A-scope photographs were taken for later numerical analysis. 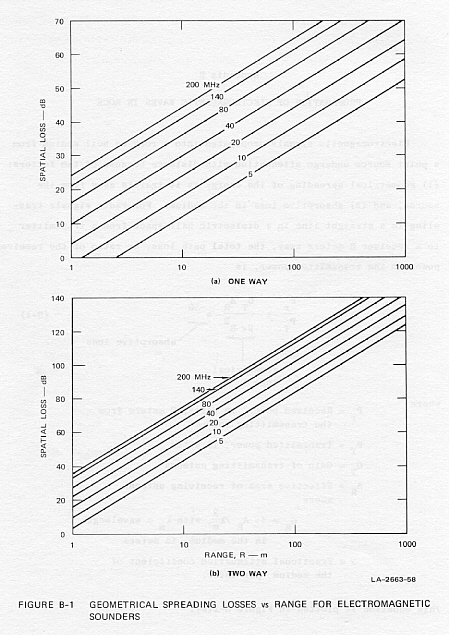 Unfortunately, this analysis was not made until eight days later, at which time it was soon obvious that propagation time delays and signal intensities were completely inconsistent with propagation through the rock--the observed signals were simply being propagated from chamber to chamber down the outer shield of the coaxial cables, and then re-radiated. Analysis of the data showed that no detectable signal could be observed through 68 m of rock between the lower chamber and Belzoni's chamber at frequencies below 20 MHz. For a transmitted peak power of 1.2 MW, 35 dB of spatial loss [see Appen. B, Fig. B-1(a)] and measured noise levels, this finding implies that the attenuation loss in the rock was well above 1 dB/m. On the basis of the earlier laboratory measurements of various small samples, losses of the order of 0.3 dB/m or less had been anticipated at a sounder frequency of 10 to 20 MHz. 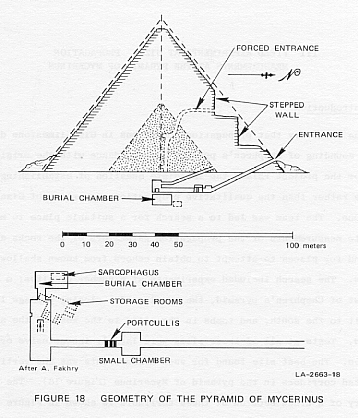 Following the first propagation experiment between the two Chephren chambers, but prior to the discovery of the fact that losses in bedrock were very high, a second set of experiments was set up to study one-way and two-way propagation between Belzoni's chamber and the north face of the pyramid (Figure 7). On September 30, Drs. Tolba and Oetzel, assisted by two Egyptian guides, began emplacement of transmitter, transmitting antenna, and receiving antenna on the north face approximately 49 m up the side from the base. (The transmitting and receiving antennas were approximately 8 m apart.) Figure 8 is a photograph of the climbing team installing the equipment on the north face. Because of the steep and highly decomposed surface, care was required in all climbing operations, not only to avoid falling down the pyramid (nearly always fatal) but to avoid dislodging rock and rubble onto the numerous tourists and camel trains that visit the pyramid each day from dawn to dusk. In spite of the disconcerting fact that no signals appeared to be coming one-way through the rock from the transmitter on the north face into Belzoni's chamber, the presence of one and possibly two echoes seen on the oscilloscope from the exterior receiver had to be accounted for. Therefore, the transmitter and receiver were next relocated 32 m and again, 76 m, up the side of the north face from the base to see if the observed echoes changed character or position. When the equipment was emplaced 32 m up the north face, the observed main echo decreased in range to 520 ns, equivalent to 140 m distance in air (or 44 m in rock of dielectric constant 10). Other weak, more questionable echoes could be seen at 600, 700, and 1200 ns when local noise levels subsided for brief periods. When the sounder was located high up on the north face (76 m from the base sloping distance), the observed "main" echo increased in range to 1250 ns and no other echoes could be seen. 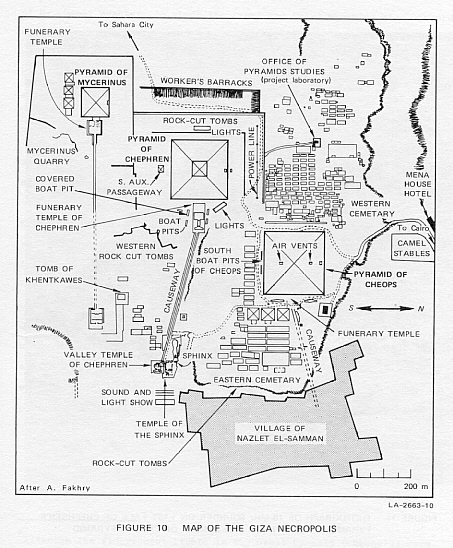 An examination of the map of the Giza necropolis (Figure 10) shows that the most likely explanation for the observed "north-face" echoes was that all of them arose through the air from targets in the Giza area and not from targets within the pyramid. While the sounder antennas couple energy poorly into air compared to rock, even 30 or 60 dB of antenna inefficiency for air-propagated signals is small compared to 100 dB or more of attenuative loss in the rock over a few tens of meters distance. It is our conclusion that the principal echo observed on the north face was a reflection from the power line running east and west along the main road 110 m north of the base of Chephren's pyramid. The other weaker echoes appear to arise from scattering from the pyramid pavement areas and cliffsides north of the pyramid. By relocating the transmitter on at least one face of Chephren's pyramid other than the north (away from the entrance passageways), the team felt it could be more certain that any signals received in the interior were propagating through the rock faces rather than spuriously down a power line or communication cable. The conclusion of two such experiments--one on the east and one on the south face--was that at no time could 1.2-MW transmissions of 10-MHz pulses be detected in Belzoni's chamber through the approximately 80 m of the limestone blocks, rubble, and mortar of the pyramid. In fact, it was also concluded that the relatively high RF noise levels observed in Belzoni's chamber at HF were largely due to signals conducted into the chamber down the power lines running in and out of the pyramid--the walls were evidently highly attenuative even at the frequencies of local broadcasting stations (0.5 to 1.5 MHz). Figure 11 shows the 10-MHz sounder equipment on the east face of Chephren's pyramid as seen from the summit of Cheops' pyramid. 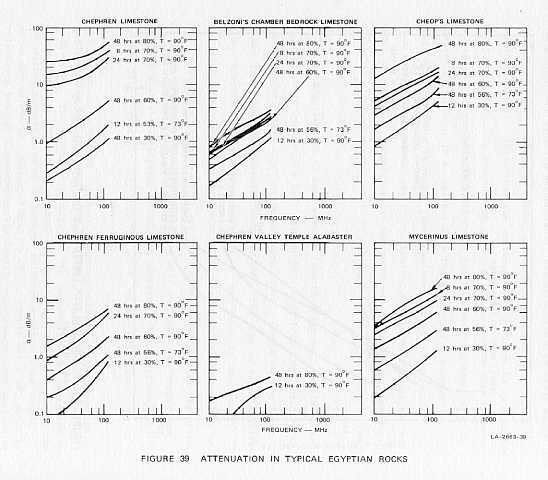 Later, permission was obtained from Dr. Henri Riad, acting on behalf of Dr. Gamal Mokhtar, to study the first and third pyramids also, in order to determine the uniformity of RF losses elsewhere at Giza. A simple and effective experiment on the pyramid of Cheops required only a few hours' time, yet was quite conclusive. 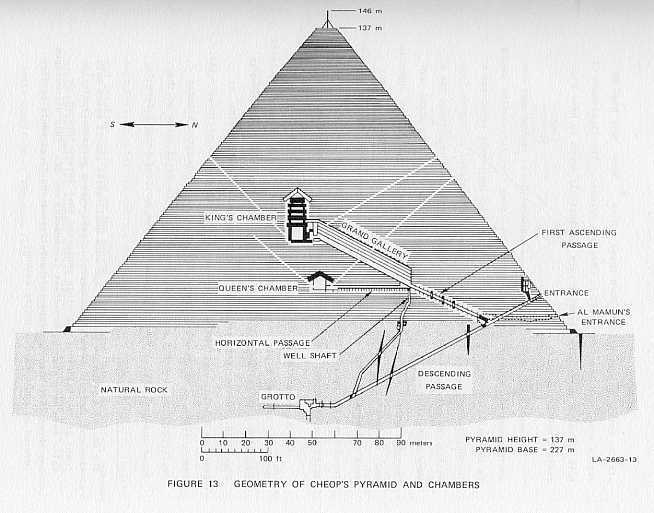 The 10-MHz transmitter and antenna were carried 100 m up the south face of Cheops' pyramid (Figure 12), and placed by the air shaft from the King's chamber (Figure 13). With our transmitter operating, a short-wave portable radio receiver was hand-carried around the base of Cheops' pyramid to the north face and into the chambers through Al Mamun's entrance. A few meters past the entrance portal, all signals from the sounder had disappeared as well as the short-wave broadcasting stations of similar frequency. Even when the receiving antenna in the portable receiver was placed next to the air shaft on the south wall of the King's chamber, no sounder signals could be heard through the intervening 50 m of rock. Qualitative checks of local broadcast stations (1 to 2 MHz) were also made in the King's and Queen's chambers and the Grand Gallery of the Great Pyramid (Cheops'), using the portable receiver. Only the very strongest Cairo broadcasting stations could be heard in the presence of noise. * Because the incoming electric power wiring in the Great Pyramid is imbedded in the walls and partially shielded, it was apparent that little, if any, of the broadcast station energy was propagated down these cables. * Thus, very high RF losses were also found to exist in Cheops' pyramid. The limestones of both of these major Giza pyramids were conclusively shown to have high radio-frequency losses. As mentioned, experiments with the sounder placed on the east and south faces of Chephren's pyramid had established that attenuative losses in the walls of the second pyramid were too high to permit receiving a 10-MHz, 1.2-MW signal in Belzoni's chamber. Therefore, no echoes from within the pyramid itself were to be expected unless the pyramid was a very nonhomogeneous dielectric. If such were the case, one might conceivably obtain scattering echoes from the specular point on the opposite cap, as indicated in Figure 14. On the east and south faces, several weak echoes were seen--all apparently from air-propagated signals scattered from the pavement and surrounding objects such as mortuary temple walls and dislodged blocks lying on the ground on the pavements. 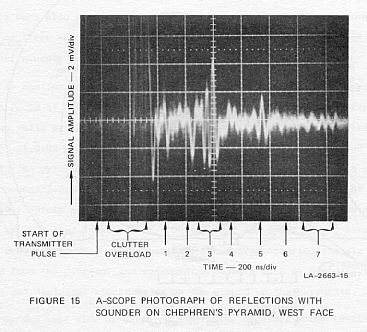 On the west side of Chephren's pyramid, receiver noise levels were unusually low and a plethora of echoes were seen. The sounder was located about 100 m up the west face. A typical A-scope photograph is shown in Figure 15. While it is tempting to hypothesize chambers, voids, or passages within the pyramid to account for at least some of these reflections, they can all probably be explained as air-propagated signals scattered from numerous blocks on the ground, the metal cover of the Sound-and-Light-Show light bank, and the 5-m vertical bedrock face to the west of the pyramid (Figure 10). One cannot rule out the possibility of some clutter or discrete echoes originating in and propagating through the surface layers of the pyramid, since RF losses may be lower in the surface layers than in the interior; however, it was felt by the team that little useful information was to be gleaned from attempts to isolate and identify every one of the echoes in the short time available. 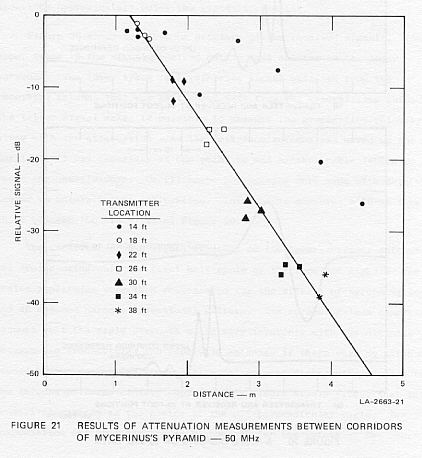 Antenna polarizations were changed from horizontal to vertical, but it was impossible to relocate the sounder either higher or lower on the west face to correlate observed echoes with sounder position because of the dangerous, unsafe condition of the west face. 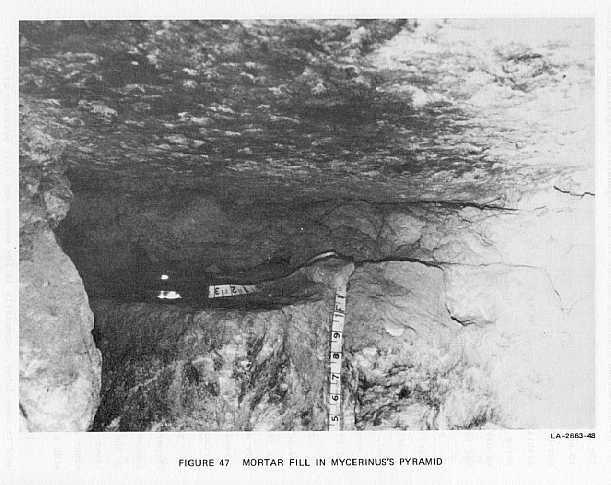 Since a 1.2-MW, 10-MHz signal could not be detected through the approximately 80 m of limestone to Belzoni's chamber from an outside face, the sounder was next located on the first course of the north face of the pyramid, just west of the entrance (Figure 16). Figure 7 shows that this is the shortest available propagation path between the surface and an interior chamber. Receiving equipment was placed in the lower chamber to search for signals propagated through the intervening 32 m. All of the weak signals observed within the lower chamber were found to be reradiated signals from the electric lighting cables in the pyramid. This was established by moving the sounder an equal distance east of the entrance and noting the lack of amplitude differences of signals in the lower chamber over a longer path length in rock. Failure to observe a detectable 10-MHz radiation through 32 m of bedrock limestone implies that the attenuative loss in the bedrock was greater than 4.6 dB/m. 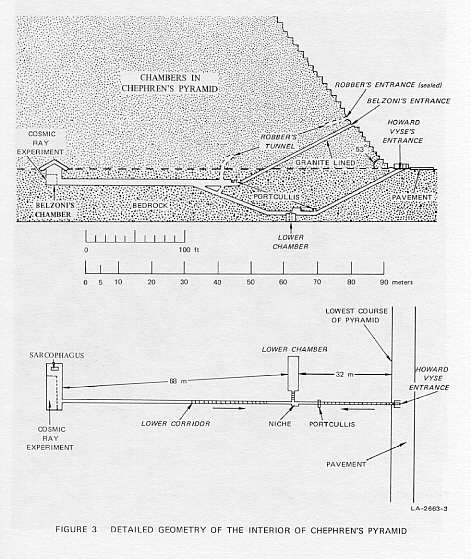 Because no shorter path in rock could be found in Chephren's pyramid, team efforts were now entirely directed elsewhere to establish the one-way propagation losses over paths in rock shorter than 20 or 30 m.
To the west of Chephren's pyramids is a vertical cliff five to thirty feet high in which numerous tombs for nobles were cut when the pyramid was built. Many of these tombs are open and accessible so that varying thicknesses of rock could be obtained by locating the sounder on the top of the cliff and a receiving antenna against the ceilings of tombs beneath. In spite of all precautions, however, several days of attempts to measure attenuation through approximately one foot of limestone roof were inconclusive because the actual propagation paths could not be established conclusively. 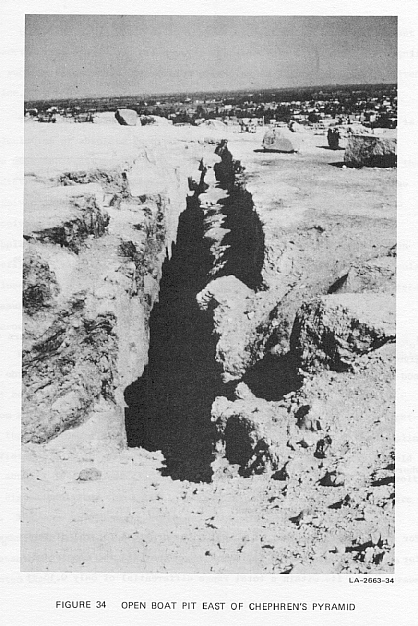 Next, efforts at short-path attenuation measurements were concentrated at a sloping passageway and pit in bedrock located just south of Chephren's pyramid (Figure 17). By emplacing a receiving antenna against the sloping ceiling of the entranceway and the transmitting and a second receiving antenna along grid lines on the surface, it was hoped that attenuation versus thickness of limestone could be measured. Again, results were inconclusive--propagation modes could not be clearly identified without ambiguities. At this point, the team divided into two groups--one studying a known, covered boat pit east of Chephren's pyramid and the second, the interior passageways of the third pyramid--that of Mycerinus. These experiments are discussed in Chapters III and IV. The discovery that propagation conditions in Giza limestone do not permit sounding of Chephren's pyramid in accordance with the original plan for the project raised the immediate question of establishing the precise rather than the qualitative propagation properties of Giza limestone. The team was led to a search for a suitable place to make accurate measurements of the propagation parameters of the rocks at Giza and for places to attempt to obtain echoes from known shallow targets. The search included experiments at a number of sites; a boat pit east of Chephren's pyramid, the remains of a sloping passage leading to a pit to the south, and tombs in the cliff to the west of the same pyramid. Tests at all of these sites were largely inconclusive or negative. The best site found for such measurements was the vertically separated corridors in the pyramid of Mycerinus (Figure 18). The geometry of a cross section of these corridors is shown in Figure 19. Measurements between these two corridors were made by locating the transmitter on the floor of the upper corridor and receiving antenna flat against the roof of the lower corridor. Timing was taken from a second receiving antenna adjacent to the transmitting antenna. The advantage of this geometry is that it is possible to run experiments in which the transmission time through the air between transmitting and receiving antennas is much larger than the direct transmission time through the rock. Where such a geometry is lacking, it can be quite difficult to identify signals propagated through the rock. In addition, signals arriving by paths other than the one desired represent measurement noise (clutter). In the worst cases, they can obscure the desired signals entirely. The corridor geometry in Mycerinus avoids the timing problems very effectively, however. When the transmitter and receiver are both 14 ft from the chamber, the shortest path around the end of the corridors through the air requires 32 ns at the speed of light. The direct path through the rock takes only about 12 ns, so there should be no spurious signals for at least 20 ns after the onset of the signal through the rock. At the other extreme, if the transmitter and receiver are both located 38 ft from the ends of the corridors, then the air path requires at least 80 ns. The direct path through the rock is 12.5 ft long, and requires only about 40 ns. There is, however, a possibility that signals can reach the roof of the small chamber in the lower corridor and propagate through the air to the antenna by a path that is somewhat shorter than 80 ns. The actual received signals appear to be clean for at least 25 ns. The measurement of transmitter and receiver locations along the corridors from the chamber at the common end was quite straightforward and accurate. The surveying equipment we had did not permit an extremely accurate survey in the cramped quarters of the corridors, however. Thus, we have been forced to assume that the apparently level portions of the two corridors are parallel. 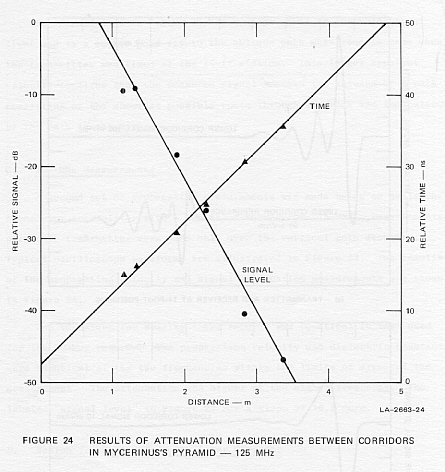 A crude survey of the angle of inclination in the upper corridor yielded a value of 23°. This figure is significantly less than the 25° or 26° quoted in the literature for other polar passages in the Giza area. We have assumed that our crude survey was less accurate than past surveys and have arbitrarily assigned an inclination of 25° in the discussion that follows. The effect of retaining the 23° figure would be to reduce the maximum transmitter to receiver distance. This would raise the apparent dielectric constant from about 8.75 to about 10. It would also increase the calculated attenuation per meter by about 3 dB. Measurements were made in these corridors using both spark and avalanche-transistor-driven transmitters. In general, the spark transmitters operate at lower frequencies and use larger antennas. For this reason, it was impossible to position the transmitting antennas at many different positions in the upper corridor. Since the few available positions for the low-frequency measurements yielded only a few points, the interpretation of these measurements is not considered very reliable. However, smaller antennas made a much more extensive measurement program feasible at nominal frequencies of 50 MHz and 150 MHz. The excellent results obtained in these measurements will be described in the sections immediately following, and the results of the lower-frequency measurements are described in Section F of this chapter. All of the measurements in the corridors of the third pyramid followed a similar pattern regarding equipment placement. The transmitter and an antenna to provide a timing reference were both located on the floor of the upper corridor. When the transmitter was moved to a new location, the upper-corridor receiving antenna was moved along with it to keep the propagation time to the reference antenna constant. The reference antenna also served as a receiving antenna for possible echoes from the roof of the lower corridor. The receiving antenna for one-way propagation measurements was held flat against the roof of the lower corridor by a large piece of styrofoam supported by wooden poles. The unique geometry of the two corridors provided an excellent differential measurement of the pulse propagation properties of the stone in situ. In a differential measurement, the signals received with the transmitter and receiver in various different locations are compared with each other. In this way, such factors as the absolute power radiated by the transmitter, the collecting area of the receiving antenna, and the coupling efficiency of the antennas to the rock do not affect the outcome of the experiment because they are held constant. While there undoubtedly were slight variations in coupling efficiency due to surface variations at the different sites, these variations are much smaller than the uncertainty in the absolute value of any of the radiative parameters. Two conceptual plans for a differential propagation measurement were permitted by the sloping corridor geometry. The simpler plan was to locate the transmitter and move only the receiver to vary the distance between them. A somewhat more complicated operation consists of moving both the transmitter and receiver so that the measurement is always made on an essentially vertical path. As the figures in this section illustrate, the two measurements differed in one important aspect. The measurement along a vertical path is always made over the path of least travel time between the transmitter and receiver. The first signal to arrive at the receiver is thus surely the signal that has traveled the entire distance through the rock. If an oblique path is chosen, as when the receiving antenna only is moved, then the path of shortest travel time is a combination of the vertical path through the rock and a horizontal path through the air. This mixed-path signal arrives first at the receiving antenna because the propagation velocity in the rock is slower than that in the air. It makes identification of the direct-path signal through the rock difficult or impossible. Measurements of both types were made with the 50-MHz equipment. In one series of measurements, the transmitter remained at the 14-ft location while the receiver was moved. In the second series, the transmitter was stationed at the locations indicated in the upper corridor in Figure 19, with the receiver placed each time in three locations approximately below the transmitter point. Figure 20 shows two A-scope displays of the received signals. The upper trace is the signal received on the test antenna in the lower corridor. The lower trace is a reference signal obtained from the receiving antenna that was kept about 5-ft from the transmitting antenna. The latter signal makes it possible to measure the propagation velocity along with the attenuation. As the reference antenna was moved up the corridor, it was necessary at one point to add another cable length to reach the oscilloscope. Oscilloscope photographs were made with both cables to maintain time calibration. This change obscures a 30-ns time shift between the two parts of Figure 20. The amplitude of the signal received on the lower-corridor antenna was scaled using only the first half-cycle of the received signal. The scaled amplitudes were then compensated for the effects of spreading loss and an assumed antenna directional pattern. The spreading-loss compensation assumes that the field strength would vary inversely with the distance between the transmitting and receiving antennas if there were no attenuation caused by the rock. The compensation for antenna directivity assumes that the antenna patterns closely approximate a simple dipole--i.e., that the sensitivity varies as the cosine of the off-perpendicular angle. The compensation due to angles is only about 5% for the points on the near-vertical path, but it is more important when the receiving antenna is moved off to large oblique angles. Figure 21 shows the results of the attenuation measurements. The three points made on a near-vertical path at each of the transmitter locations cluster closely together around the solid line in the figure. The solid line represents an attenuation of 14.75 dB/m, but other lines can also be drawn through the points to obtain values from about 14 dB/m to 17 dB/m. The difficulty in scaling correctly when only the receiving antenna is moved shows up in the scattering of points obtained when the transmitter remained fixed at the 14-foot station. 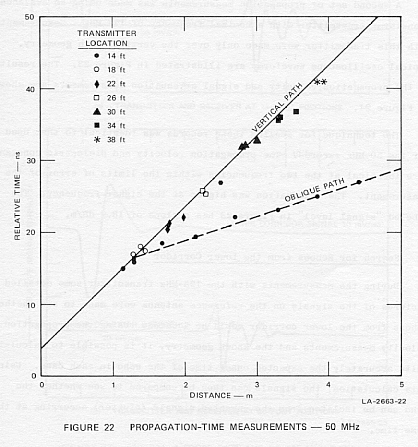 Figure 22 shows the propagation-time measurements made with the 50-MHz transmitter. The zero time indicated in the figure has not been accurately located to correspond with the onset time of the transmitted pulse. The solid line shows that the vertical-path measurements fit a constant slope of 9.87 ns/m very well. The velocity is 0.338 c, and the corresponding dielectric constant is 8.77. The dashed line in Figure 22 has a slope equal to the velocity of light and is a rather good fit to the oblique path measurements made when the transmitter was fixed at the 14-ft station. This larger apparent velocity confirms that the measured signal reached the antenna by a path consisting of the shortest possible route through the rock and the balance of the path in the air. A second set of propagation measurements was made using an avalanche-transistor transmitter with a nominal frequency of 125 MHz. Measurements with this transmitter were made only over the vertical path geometry. Typical oscilloscope waveforms are illustrated in Figure 23. The results of the propagation velocity and signal attenuation measurements are shown in Figure 24. The technique for scaling these records was identical to that used for the 50-MHz records. The propagation velocity and dielectric constant were identical at the two frequencies within the limits of error of the measurement. The attenuation was higher at the higher frequency. The labeled "signal level" in Figure 23 has a slope of 18.2 dB/m. During the measurements with the 125-MHz transmitter some detailed pictures of the signals on the reference antenna were made to see whether echoes from the lower corridor could be located. Using the propagation-velocity measurements and the known geometry, it is possible to calculate quite accurately the expected onset time of the echo in each case. Using this calculation, the signals can then be compared to see whether the echo can be isolated from the unwanted signals (clutter) occurring at the same time. 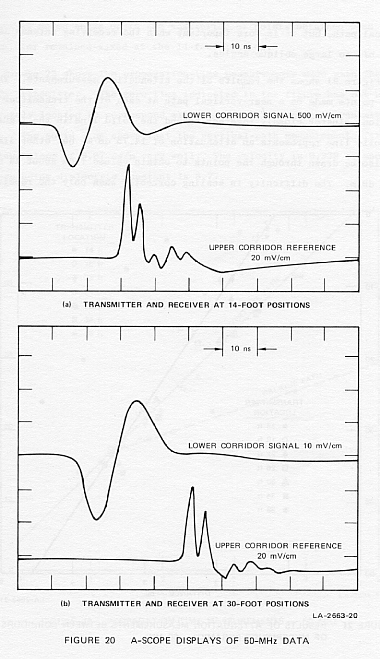 Figure 25 shows the echo sounding signal obtained from the 14-ft transmitter station. The first pulse to arrive at the receiving antenna, as indicated in the figure, travels through the air from the transmitting antenna. The second pulse shown arrives at the receiving antenna through the rock, 10 ns later than the first pulse because of the slower velocity of propagation. The difference between the propagation time in rock (9.87 ns/m) and the propagation time in air (3.33 ns/m) is 6.54 ns/m and can be used to calculate that the transmitting and receiving antennas were separated by 1.53, m or 5 ft. The calculated onset time of the expected echo is also shown in Figure 25 followed by a low-frequency monocycle in the waveform. The low frequency represents the expected characteristic of an echo, because the dispersive attenuation of the rock lowers the frequency of the propagated signals. The signal is not so outstanding, however, that it represents a very convincing echo. 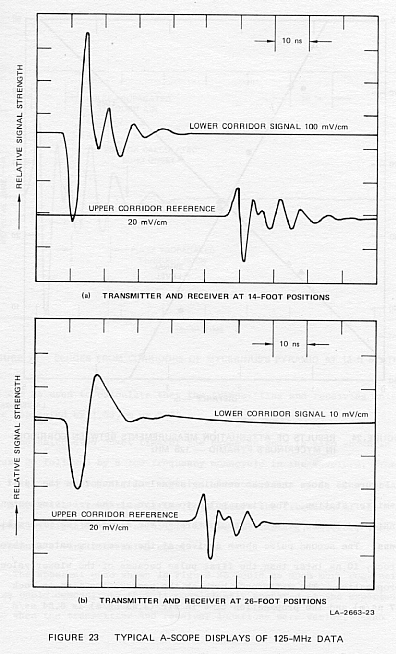 The apparent echo shown in Figure 25 would be much more convincing if we could demonstrate that it consistently appeared at the expected time when the transmitter and receiver locations were varied. Echo soundings made at four different stations can be used to demonstrate that this consistency is observed. In Figure 26 the four echo soundings have been overlaid to emphasize the consistently appearing echo. The expected onset time of the echo was calculated for each position, and the successive traces have been aligned one above the other according to the calculated echo time. The shift in the transmitter pulse caused by this alignment is large enough that the early parts of the traces shown are almost completely decorrelated. In contrast with this behavior, the low-frequency signal that occurs just after the calculated echo onset time is very similar in each case. This similarity indicates that the low-frequency signal is very probably the echo from the roof of the lower corridor. (1) The echo in this case was obtained from a maximum depth of 1.65 m. At this range, the echo strength is not more than 10 dB above the clutter level for the next 20 to 40 ns. Even though it might be feasible to improve the receiver sensitivity and overcome the resulting overload problems, the clutter will provide the sensitivity limit. With the 36-dB/m attenuation rate for round-trip signals, this means that the sensitivity limit will be reached at less than 2 m depth. (2) It is likely that the clutter consists almost entirely of air-propagated signals. As a consequence, a rather small change in the attenuation characteristics of the rock can make quite a large difference in the maximum possible sounding depth. 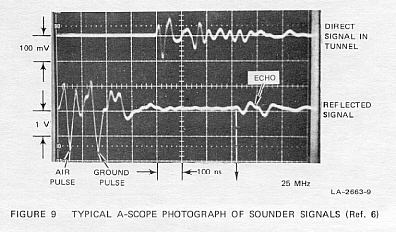 (3) Figure 26 demonstrates the usefulness of moving the sounder and comparing the resulting signals to separate echoes from clutter. Even better than the quite laborious comparison made in this case is the display of data obtained by continuously moving the sounder and obtaining a continuously varying data display. (4) The minimum useful echo depth is determined by the end of the transmitter pulse propagated to the receiving antenna through the rock. With the 5-ft antenna separation used here, the rock-propagated transmitted pulse ends about 28 ns after the transmit-pulse initiation. Consequently, an echo must come from a depth of at least 1.4 m if it is to be visible after the transmit pulse. If the transmitting and receiving antennas are collocated as nearly as possible, the rock-propagated transmit pulse will be moved almost 15 ns earlier in time, but it will also have much larger amplitude. Although overload of the receiver amplifier and close-in clutter may still limit the sensitivity to close-in echoes, this calculation suggests that echoes from objects as close as 0.7 m may possibly be delineated. All references to transmitter frequencies thus far have been to nominal frequencies of 50 MHz and 125 MHz. The reason for these vague references is that the transmitting antenna is a part of the frequency-determining circuit. Because it is tightly coupled to the rock, the impedance-versus-frequency characteristic of the antenna is partly determined by the dielectric constant and loss tangent of the rock. Thus there is no universal frequency for a particular antenna. This characteristic is particularly important for the avalanche-transistor transmitters. In these transmitters, a capacitor is discharged into the antenna using the avalanche transistors as a switch. The discharge has no characteristic frequency of its own. The oscillating current is created entirely by the filter characteristics of the antenna. As a general rule, the attenuation of rock becomes greater at higher frequencies. When radio frequency signals propagate a given distance through the rock, the higher-frequency components are attenuated more than the lower-frequency components. The result of this frequency-selective attenuation (dispersion) is a filtering action that makes the apparent frequency of the radio frequency signal decrease with distance. This effect can be seen in the data obtained in the pyramid of Mycerinus. In Figures 20 and 23, for example, the upper waveforms oscillate at a higher frequency than the lower. All of the waveforms from the Mycerinus experiments have been scaled to determine an apparent frequency by measuring the period of the first half-cycle of the propagated signal. Figure 27 shows the results of this scaling. While there is some scatter of the points in each case, the frequency apparently decreases approximately linearly with the propagation distance. This fact makes it very tempting to extrapolate the experimental data to zero distance and assign actual frequencies of 76 MHz and 148 MHz to the nominal 50-MHz and 125-MHz transmitters. To determine whether this extrapolation makes sense, some computer calculations were made using a simple model of the pulse-generation and propagation process. Figure 28 shows the source pulse simulating the discharge of a capacitor into a resistive load and the radio frequency pulse resulting from filtering this pulse with two digital filters. The major filter determining the pulse shape is a two-pole butterworth high-pass filter with a 40-MHz 3-dB frequency. The high-frequency cutoff set by a three pole butterworth filter at 100 MHz affects only the initial slope. To provide a simple model of dispersive attenuation, a constant attenuation per wavelength was assumed. In this model, the attenuation in dB for each frequency component is linearly proportional to frequency. For simplicity, the model calculation modified only the amplitude of the frequency components without varying the phase. Such a filter is not causal, and causes the pulse to begin earlier in time than the original source pulse. In this sense and in the simple frequency variation of the attenuation, the model is not realistic. Yet it does preserve many of the important characteristics of the experimental measurements. 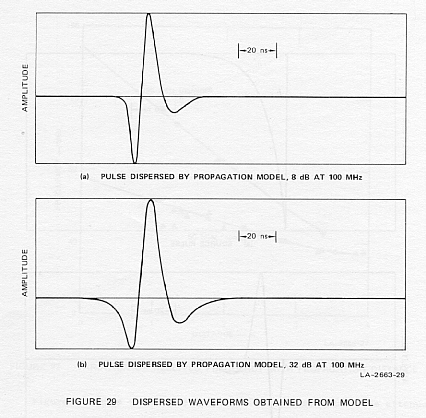 Figure 29 shows two of the dispersed waveforms. Since the attenuation is linear with frequency, it is readily specified by indicating the value at 100 MHz, which is 8 dB and 32 dB in the two cases shown. There is a definite resemblance between these waveforms and those obtained in the experiments, though the second negative excursion is somewhat too large. 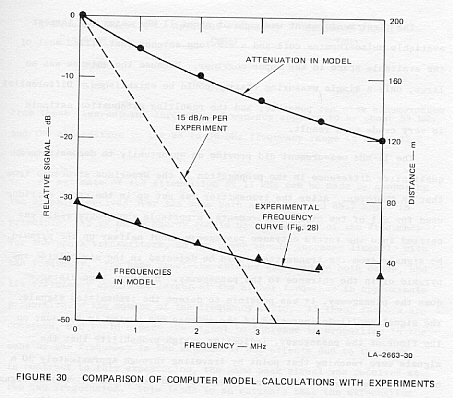 The model can be further compared with the experiments if a distance scale is assigned, rather than just the total attenuation at 100 MHz, as is indicated in Figure 29. For example, one might assign a range of one meter to Figure 29(a), and four meters to Figure 29(b). This generates a model in which the attenuation is 8 dB/m at 100 MHz. Because the model assumes that the attenuation is directly proportional to frequency, the same model has an attenuation of only 4 dB/m at 50 MHz. If the frequency and amplitude of the model pulses are scaled in the same way as the experimental data, the two sets of results can be compared simply. Figure 30 shows this comparison for the model having 8 dB/m attenuation at 100 MHz. The figure shows that the model frequencies match the experimental frequencies very closely, but the total attenuation in the model is much less than in the experiments. Thus, the model reproduces very well the dispersive frequency shifts observed, but it is too simple to match both the dispersion and the total attenuation. If a different scale factor had been selected for the attenuation per meter at 100 MHz, the experimental amplitude data could have been matched, but the frequency behavior would then have been incorrect. 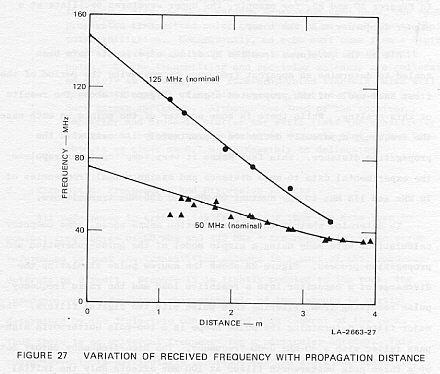 The good match of the model and experimental frequency curves indicates that the extrapolation to zero range of the measured frequencies shown in Figure 27 probably provides a good measure of the original transmitted frequency. The mismatch of the model and experimental curves when the frequency curves are matched indicates that the rock is less dispersive than the constant-attenuation-per-wavelength model. Measurements were also made in corridors of Mycerinus' pyramid using the spark-driven transmitters that were intended to sound the body of Chephren's pyramid. The first measurement was made at about 11 MHz using the largest available pulse-forming coil and a 6-m-long antenna that filled most of the available space in the upper corridor. Because the antenna was so large, only a single measuring station could be established. Differential measurements were not possible, and the resulting attenuation estimate is very crude as a result. The 11-MHz measurement did provide an opportunity to demonstrate a qualitative difference in the propagation in the Mycerinus structure from that in Chephren. After the transmitter was set up in the upper corridor used for all of the other measurements, a portable short-wave radio was carried into the forced entrance passageway about halfway up the pyramid. No signals from the transmitter could be detected in the air outside the pyramid or in the entrance to the passageway. However, some distance down the passageway, it was possible to detect the transmitted signals. The signal amplitude increased if the antenna was buried in the dust on the floor of the passageway, indicating a high probability that the signals were reaching that point by traveling through approximately 30 m of rock. There are no wires in either corridor to act as extraneous signal carriers. Because part of the forced passageway descends vertically toward the corridor where the transmitter was located, there is a part-rock, part-air path that is shorter than the all-rock path. 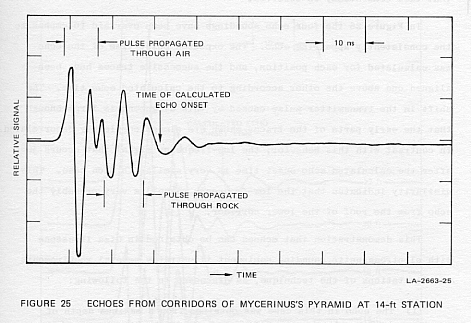 The passageways are waveguides far below cutoff at 11 MHz, however, and the stronger signal when the antenna was in the dust on the floor supports the idea that the 11-MHz signal may have traveled between the two corridors by a path entirely within the rock structure of the pyramid. From these figures, the zero-range frequency appears to be about 53 MHz, and the attenuation in the 28-to-36-MHz frequency range is about 12.3 dB/m. An estimate of the attenuation at 11 MHz can be made by comparing the signals received over the same path at 11 MHz and 35.7 MHz. In principle, the RF pulse energy should be independent of the frequency for the spark transmitters, so the power should increase linearly with the frequency. The same receiving antenna was used in both cases, and its efficiency should be larger at the higher frequency in approximate proportion to the square of the frequency ratio. If these factors are combined, one would expect the signal to increase in proportion to the cube of the frequency in the absence of any effects due to the rock. In contrast to this expectation, the same peak signal was received at the two frequencies. This leads to an estimate that the attenuation was about 15 dB less at 11 MHz than at 35 MHz over the 2.44-m path, or about 6.2 dB/m. This gives an estimate of 6.1 dB/m for the attenuation at 11 MHz. The attenuation measurements described in the preceding sections represent four rather crude points on a frequency-versus-attenuation graph. In three cases, the average attenuation over a rather large range of frequencies has been determined, while in the fourth case a rather large error bar must be placed on a single-frequency measurement. When these points are plotted on a single graph, as in Figure 31, they provide an acceptable fit to a square-root-of-frequency relationship. This conclusion agrees well with the finding that the linear frequency relation used for the computer model represented excessive dispersion. We hope that in the future it may be possible to perform further analysis of these excellent data that would lead to more definitive scientific results. For example, it could be worthwhile to digitize the waveforms from the oscilloscope photos and Fourier-analyze them to obtain a much better set of curves for the attenuation-versus-frequency characteristics of the rock. 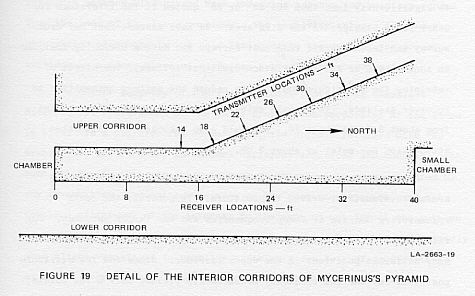 The unusual geometry of the Mycerinus corridors provided an almost unique opportunity for making such differential measurements in situ. The measurements made under these unique circumstances deserve a full analysis. As mentioned in Chapter I, the area in the near vicinity of the pyramids in the Giza complex has yielded a number of archaeological finds of major importance within the last 50 years. The discovery of two funerary boats of Cheops (on the south side of the pyramid) in 1954, one of which has now been completely restored, are examples of such discoveries. The pits in which such boats were hidden in ancient times seemed to our team ideally suited for detection by short-pulse electromagnetic sounder techniques. The pits were hewn out of the native limestone bedrock--often in the shape of the Pharaoh's boats--and the boats were deposited in these pits for the Pharaohs' use in their after-life journeys. The chambers were then covered with one or more layers of large slabs of limestone, and mortared in place to form an airtight roof over the boats. Subsequently buried under debris and wind-blown sand, the locations of some of the funerary boats has remained unknown to recent times. Several more are believed to be as yet undiscovered in the Giza area. 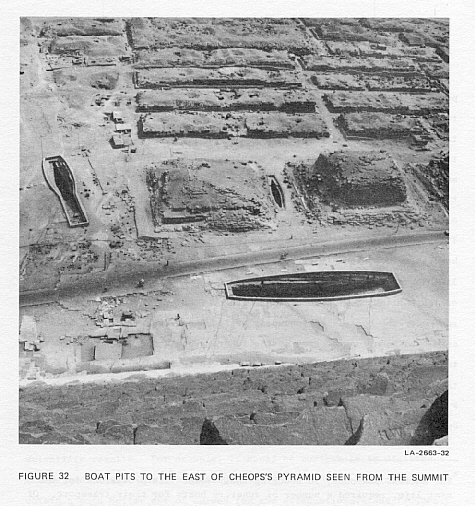 * A photograph taken from the top of Cheops' pyramid, Figure 32 shows three of Cheops' boat pits opened earlier, lying on the east side of his pyramid. To determine the feasibility of boat-pit detection using electromagnetic pulse echo sounding, tests were performed on a known boat pit alongside the east face of Chephren's pyramid (see Figure 33). Figure 34 shows a very similar, adjacent boat pit (in ferruginous, badly weathered limestone), missing its stone roof. The boat pit of Figure 33 had its entire roof structure intact (32 inches thick), although it had been explored in ancient times by forced entry through one end and side. 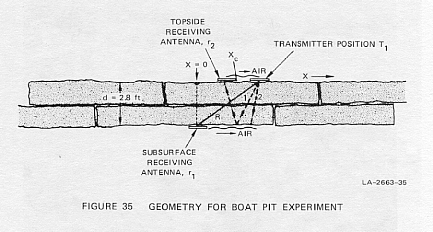 The geometry of the experiment is illustrated in Figure 35, which shows the position of the transmitter, T1, on the surface and the receiver, r1, on the chamber ceiling inside the boat pit. Another receiving antenna on the surface at position r2 was used as a timing reference. Our first experiment was to measure the one-way transmission losses through the approximately 0.8 m of limestone roof slabs at an operating frequency of 125 MHz. d = thickness of the rock. For a dielectric constant of er = 10, the critical lateral distance xc for the case above is 0.9 ft, which means that all the meaningful measurements lie within a total range differential of only 0.13 ft. Unfortunately, such a small range increment means that measurement uncertainties and errors are greatly magnified--in fact, they are magnified to such an extent that the results presented in Figure 36 are of limited value. The alternative to a range-differential estimate of attenuation is calculation of absolute received power from Eq. (B-1) in Appendix B. The main uncertainties in this calculation are the absolute value of the radiated power and the antenna coupling efficiency into the rock. The received power was measured with the transmitter directly over the receiving antenna at position x = 0 (Figure 35). Assumed values of coupling efficiency of 10 percent to 50 percent yielded an attenuation coefficient ranging from 8 to 10.5 dB/ft (26 to 34 dB/m). These calculated values are also shown in Figure 36 for comparison with the range-differential measurements. These values are slightly greater than those of the bedrock under the pyramid of Mycerinus at the same frequency. 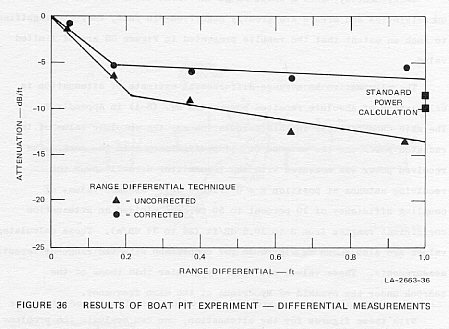 With these figures for the attenuation, one can evaluate the problems of obtaining echoes from the boat pit. The power reflected from the boat-pit ceiling that should be observed at receiver r2 may be calculated from Eq. (B-2) in Appendix B. Assuming that the reflection coefficient at the limestone/air interface is approximately 0.5, and antenna coupling efficiency only 10 percent, the power return to the receiver, r2 should be about 3 mW (microwatts). This corresponds to about 170 mV (millivolts) of signal amplitude, or a little less than one scale division in Figure 37. The echo should occur at 16 ns, after the onset of the direct transmitted signal occurring at t0, and as can be seen, the direct transmitted pulse through air from T1 to r2 at that time obscures the wanted echo. 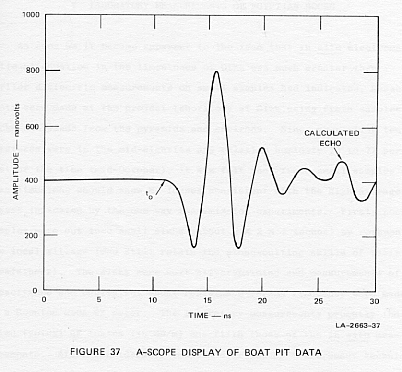 The conclusion based on these measurements is that electromagnetic sounder techniques are marginally suited for locating boat pits in the Giza area provided that the transmitter pulse length can be kept very short and the direct air-propagated signal minimized. Because the pits are relatively shallow, the probing pulse must be as high in frequency as losses will allow, and the pulse length must be held to a single cycle so that any wanted reflections do not occur within the time domain of the transmitted pulse. A further detection aid would be a modest antenna array that would discriminate against clutter and surface targets but would accentuate returns from flat surfaces such as boat pit ceilings. A suitable boat pit electromagnetic sounder should be mounted on a towable cart with a paper--chart printout showing echoes on a depth-versus-horizontal-position display. Such a display also aids in further discrimination between clutter and wanted echoes. As soon as it became apparent to the team that in situ electromagnetic attenuation in the limestones of Giza was much greater than earlier dielectric measurements on small samples had indicated, measurements were made at the project laboratory at Giza using fresh samples of rocks and sands from the pyramids and environs. Since prevailing temperatures were in the mid-eighties and relative humidity 70 to 77 percent most of the time (mid-October), it was felt that fresh small samples of Giza limestone should show RF losses consistent with the high average losses indicated by the one-way transmission experiments. First, rock samples were cut into small slabs (about 2 × 2 × 1 inches) by workmen from the local village (who still retain the stone-cutting skills of their forefathers). The slabs were next silver-painted and measurements of capacitance and equivalent shunt resistance versus frequency were made on a Boonton 250A RX meter. The laboratory measurements promptly indicated typical RF losses (in dB/m) one-fifth those of the in situ measurements. After considerable concern over the RX measurement technique, the discrepancy was finally resolved by further studies at SRI's Menlo Park Laboratory in an environmental test chamber. Next, a collection of rock samples from Giza (as well as elsewhere in Egypt) were cycled in a test chamber beginning from high humidity to low at approximately constant temperature, over a period of two weeks. It was found that most samples required about two days to reach equilibrium. Again, the RF attenuation factor, a, was found to be strongly sensitive to ambient relative humidity even for a change in humidity of only 10 percent. Figures 39(a) and 39(b) show these results. Egyptian sands and granite from Aswan showed not only low losses by comparison, but also minimal sensitivity to ambient humidity. The environmental-chamber data showed not only that the losses of the Giza limestones were highly sensitive to local relative humidity, but also that the rocks were sufficiently porous so that small samples equilibrated with the environment in a few days' time. 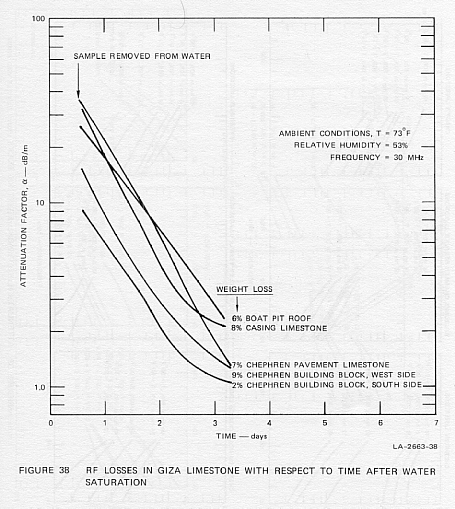 Evidently the rock samples lying around the surface at Giza, selected for our Giza laboratory tests, were slightly drier than either the bedrock or the large building blocks in which the in situ measurements were made, and this accounted for the lower losses in the samples even when measurements were made under Giza ambient environmental conditions. The relative humidity at Giza is moderately high because of a prevalent, almost year-round onshore flow of marine air from the Mediterranean; therefore, the interior of the pyramids must be still more humid to account for the discrepancy between the sample and in situ data. * One of the team members, Robert Bollen, after noting the constant 83-percent humidity in Belzoni's chamber (temperature, 85°F), decided to measure the humidity level in Mycerinus' pyramid where no tourists are presently permitted. He found the humidity in the Third Pyramid to be also 83 percent. Before the Mycerinus pyramid humidity measurement, the team had assumed the 83-percent humidity level in Belzoni's chamber was a result of the daily influx of tourists. However, apparently the interior of the pyramids and the bedrock are naturally very damp--83 percent relative humidity represents probably equilibrium between the rock and the noncirculating air of interior chambers. At the time of the opening of the Great Pyramid by Caliph Al Mamun in AD 820 after it had been sealed for many centuries, the interior chambers were found "mysteriously encrusted with salt as much as one-half inch thick,"7 consistent with rock that is by nature damp and porous. Perhaps the data shown in Figures 39(a) and 39(b) can be better understood by replotting, and this has been done to produce Figures 40 through 43. 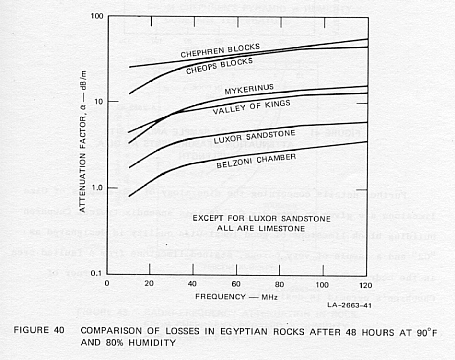 In Figure 40 the attenuation factor, a, for typical Egyptian rocks is shown with respect to frequency after the rocks were soaked 48 hours in an environmental test chamber at 90OF with 80-percent humidity. Figure 41 emphasizes the sensitive dependence of radio-frequency losses as a function of humidity. 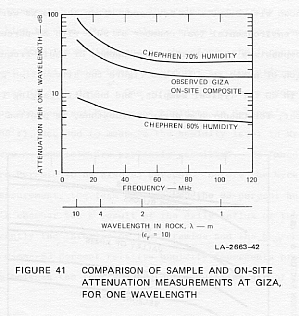 In this figure the attenuation per unit wavelength in dB for typical samples, and humidity ranging from 60 to 70 percent, for Chephren's pyramid limestone, is plotted for comparison with on-site data. 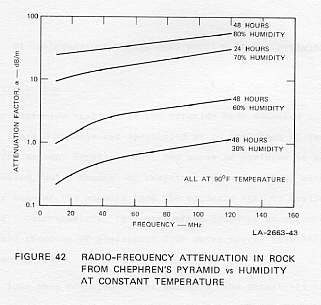 Figure 42 shows the RF attenuation factor, a, in dB per meter with respect to frequency in rocks from Chephren's pyramid at constant temperature. 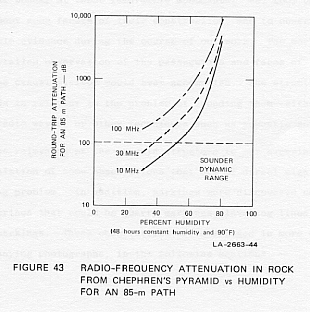 Figure 43 shows the round-trip RF attenuation in dB for an 85-m path plotted with respect to percent humidity in rocks from Chephren's pyramid. The sounder's approximate available dynamic range is shown by a dotted line in Figure 43, at 100 dB. Further details concerning the mineralogy of two samples of Giza limestone are given in Appendix C. In this appendix typical Chephren building block limestone of good local-Giza quality is designated as "G2" and a sample of very porous, stained limestone from a faulted area in the bedrock of the rock-cut tombs near the northwest corner of Chephren's pyramid is designated as "G1". For centuries visitors to the pyramids have wondered at the immensity of these monuments and speculated as to the means of their construction. The ancient Egyptians left few words or pictures to help solve this problem, but a handful of competent scientists have managed to piece together some of the answers from the evidence that is available in the pyramids. Unfortunately, this work often tends to be obscured by much-publicized theories of assistance from outer space, lost Atlantis, and other such wonders. No less than countless other visitors, the scientists of our team felt the wonder at these remarkable monuments. We, too, began to speculate about some facets of their construction, and to observe some of the available evidence during the course of our work. The work required for more detailed observation of the passageways and faces of the pyramids than the casual visitor would ever accomplish. The structure of the pyramids is relevant to the problem of sounding them--either by cosmic rays, radio waves, or other techniques such as acoustic sounding. The relevance of the pyramid structure to our experiment leads us to documentation of some observations that are of direct significance to the sounding problem. In addition, markings were discovered on the pyramid of Mycerinus that could be quarry markings, leveling lines, and survey sight markings. These observations are discussed in more detail, with accompanying photographs, in the following sections. In a single sentence Edwards8 notes the use of irregular blocks, but this hardly emphasizes the possible implications for sounding experiments. Mendelssohn9,10 has given a much more comprehensive view of the construction of the pyramids, and the engineering reasons for some of the construction techniques. 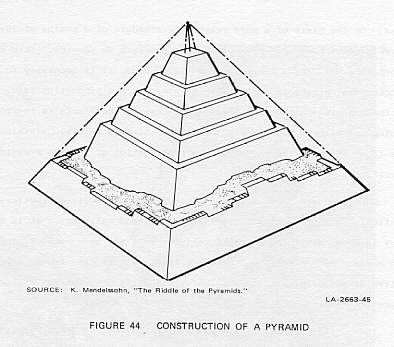 For example, he notes carefully that all the pyramids are constructed around a stepped core, as shown in Figure 44. Mendelssohn comments that irregular blocks cause pressure points that can lead to structural failure in a pyramid. He stresses that while irregular blocks and debris were used, sound "buttress" walls are required every few meters to assure stability of the structure. Mendelssohn concentrated his attention primarily on the engineering developments that made it possible to build the pyramids at Giza. The use of irregular blocks and fill at Giza suggests that the evolution of pyramid engineering did not end with the construction of Cheops' pyramid. Rather, the pyramids of Chephren and Mycerinus show a trend toward labor-saving construction techniques following the construction of Cheops' pyramid. The reasons for a desire to save labor in constructing pyramids are not difficult to understand. If one accepts the figures that the construction of the Great Pyramid required laying 2.3 million blocks in 20 years, then a block must have been laid, on the average, somewhat more often that one each five minutes, 24 hours per day for the entire period. Following this reasoning still further, it is unlikely that the entire construction crew worked either 24 hours per day or 12 months out of the year. On the basis of a more reasonable schedule of 3 months of 10-hour days, a block must have been put into place each 30 seconds. This under-scores the need for a large labor force, because it is necessary to process many blocks in parallel to maintain such a production rate. One of the most labor-consuming tasks in processing the blocks is the finishing operation. Using irregular blocks wherever possible minimizes the labor of finishing and makes the construction of a large pyramid significantly less costly. Core segments that provide a view of the construction practices are available in the pyramids where there are forced entrances. It is necessary in each case to be aware of features that may be a product of forcing the entry. But in addition there are features that clearly are representative of the original construction practices in these passages where there are no finishing stones to obscure the construction. The tourist entrance (Al Mamun's entrance) to the Great Pyramid is through such a passage, cut only a few courses above the bedrock level. Close examination of the passage confirms the popular notion that the construction standards used in the pyramid of Cheops are significantly better than in the other Giza pyramids. The first seven enormous blocks along the passageway are rectangular and reasonably well finished. Beyond this point, however, the standards change somewhat. Figures 45 and 46 are photographs which show examples of the construction practices in the entrance corridor in Cheops' pyramid. Figure 45 shows blocks meeting at irregular angles, with mortar and a moderate-sized rock used for fill at the joint. Figure 46 shows blocks in the ceiling of the passageway that are rather well fitted to each other, but not square. The long object is a fluorescent light fixture. The scale shown in these and the figures that follow is a surveyor's tape calibrated in feet and tenths of feet (not inches). Construction standards appear to have degenerated significantly with the construction of the second and third pyramids at Giza. 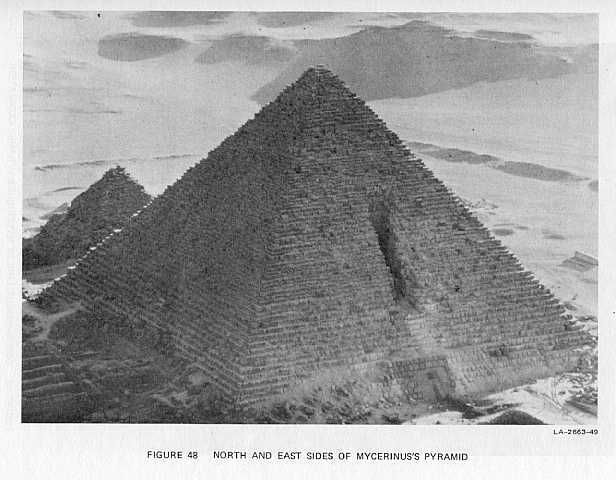 It is important to note, however, that these pyramids were stable constructions that did not collapse as the one at Meidum apparently did.9,10 It appears that stability was achieved in spite of the use of many irregular blocks by using a substantial amount of mortar fill to distribute the pressure evenly. The easiest place to observe this construction technique is in the forced passageway in the third pyramid. Figure 47 is an excellent example of the use of mortar fill in the third pyramid. The lower block, on which the tape rests, has been only crudely finished. The bottom surface of the upper block, on the other hand, is quite flat. The mortar fill varies in thickness from about 8.5 to over 12 cm. Certainly, there was no attempt in this case to use careful fitting to avoid the pressure points that can cause structural failure. The flat lower surface of the upper block appears to be a universal characteristic of the irregular blocks in the third pyramid. The need for the flat lower surfaces is simply explained by supposing that the blocks were moved on rollers for part of their route from the quarry to the pyramid. Rollers require a minimum standard of flatness for the bottom surfaces of the blocks. The large amount, of mortar and other debris used for fill in the Chephren and Mycerinus pyramids, coupled with the flat-bottomed rocks, suggests another aspect of the construction technique. Irregular tops on the construction blocks make a very poor surface for rolling the next layer of blocks into place. If a layer is first filled with mortar and other debris, however, the top can then be watered and smoothed to provide a good surface for placing the next layer of blocks. It thus appears that irregular blocks and a lot of fill have been used to save labor, especially in the second and third pyramids at Giza. The labor saving effected in this way would be considerable, because the task of careful measurement and fast finishing or trimming required otherwise is a major part of the labor requirement in placing finished blocks. 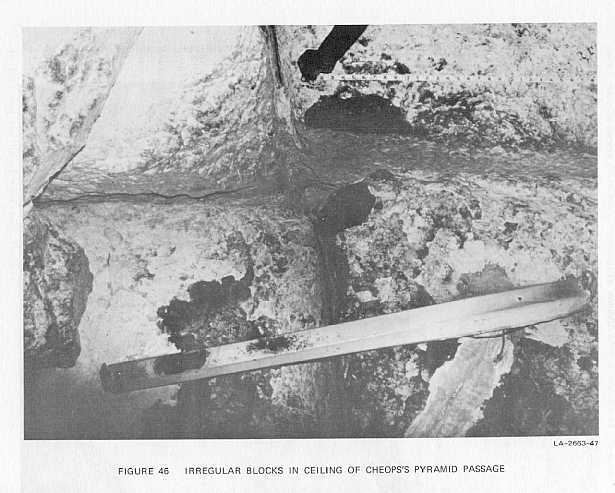 Observations of Chephren's pyramid in the passageway within the bedrock leading to Belzoni's chamber show that there is a section of approximately 40 ft where the walls, floor, and ceiling of the foundational structure have been replaced with limestone blocks. 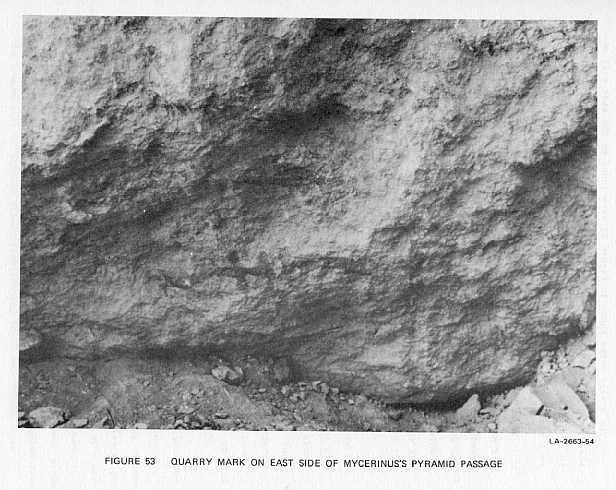 Upon observation of the exterior bedrock at the east side of the pyramid, it can be seen that the bedrock in this area is of inferior quality, and is faulted and mineralized, so as to make the foundational structure brittle. This faulted region appears to emerge again in the rock-cut tomb area near the northwest corner of the pyramid. Perhaps this is why the 40-ft portion of the tunnel was replaced with good quality limestone blocks. The faulted zone may also have an important effect on the propagation of radio signals between the two chambers in Chephren's pyramid. The debris and mortar have a significant bearing on radio sounding. Even where the rock has relatively good radio properties, the mortar is made from gypsum and sand and has been determined to be relatively lossy. In addition, the volumes of fill are not necessarily small with respect to the radio-frequency wavelengths and therefore would contribute more than originally expected to the unwanted clutter background scattering, even if the basic rock were low loss. The fill between the rocks also has a bearing on the potential for acoustic sounding of the pyramids. Because the interstices between the rocks are mostly filled with mortar, rather than air spaces, the potential for acoustic sounding looks better than one might have thought in the absence of a detailed study of the pyramid structure. The block structure of the pyramids still represents a propagating medium with a large amount of built-in, unwanted scattering, however. During the course of our exploration and measurements in the pyramid of Mycerinus, a number of markings in dark red paint were noted in the forced entrance area. They appear to be both quarry marks and surveying indications used in placing the sloping pyramid on the outside of a step pyramid core. The excavation shown in Figure 48 was made in 1215 AD, and most of the markings that were exposed at that time have been lost to weathering in the ensuing 760 years. However, the bottom of the excavation was left covered with the debris hauled out in cutting the passageway into the interior of the pyramid. Approximately 2 m of debris covered the exposed portion of the lower part of the stepped wall, protecting a number of markings that were painted on it. 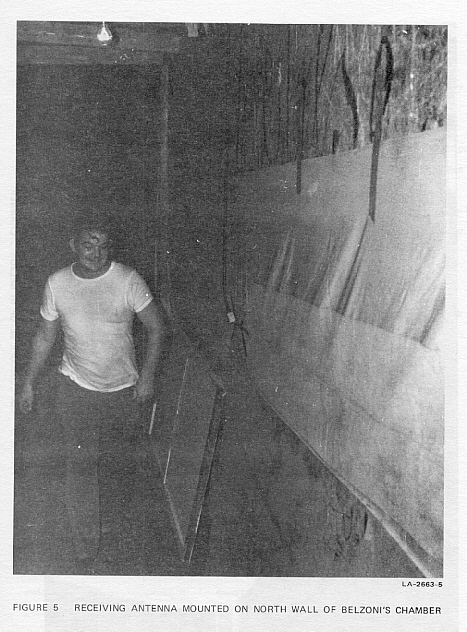 The debris was cleared in 19671 under the supervision of Dr. Ali Hassan, but the markings were apparently not noticed at that time. In 1968 A. Hassan,11 excavating on the fifth course of the granite outer casing, found a hieroglyphic inscription carved in rock and including the name of Mycerinus three times. This is the first time such an inscription has been found on the outer casing of a Giza pyramid. 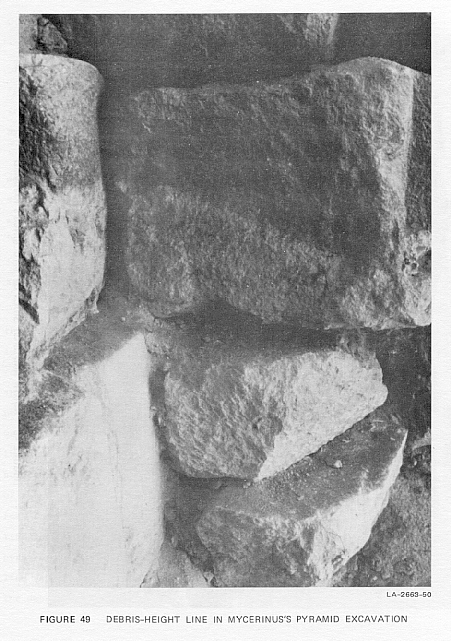 Figure 49 shows the top of the exposed stepped wall. The line separating the light and dark colored rock indicates the depth of the debris that was cleared. 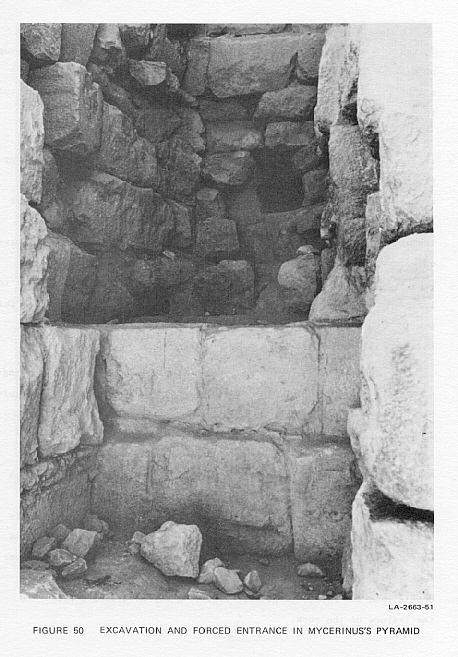 Figure 50 shows the exposed top of the lower stepped wall and the forced entrance at the bottom of the excavation. 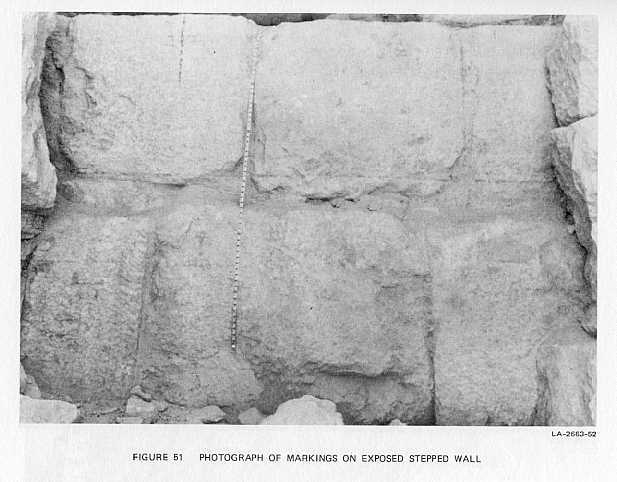 Figure 51 is a close-up photograph of the exposed wall after it was cleaned carefully to expose all of the markings. The markings are quite faint, and some are difficult to see in the reproduced photograph. The horizontal lines covering several blocks are suggestive of leveling lines used as aids in placing the blocks laid on the outside of the interior stepped walls to complete the true pyramid. These marks were made after the blocks were in place, as indicated by the fact that the marks are painted on the mortar between the blocks, as well as on the blocks themselves. One of the figures on the wall is very suggestive of a surveying sight. Another suggests the alignment of the entrance. The "4" under the overhang at the lower center appears to be a pointer to indicate that the leveling line is on the underside of the overhang. This provides an indication that the blocks on the outside of the interior stepped walls were never carefully finished. In addition to the markings on the stepped wall, two quarry markings were found in other nearby locations. We noticed the one shown in Figure 52 in a dark corner off the forced passageway in the very weak light filtered in from the entrance. Better lighting disclosed this clear marking on a quite irregular block that appears to have broken because of structural stress. We cannot determine, of course, whether the rock broke before or after the passageway was forced nearby. However, the marking is in an alcove that may have a volume approaching 1 m3. There is no evidence of mortar covering the marking on the rock, and it seems unlikely that the passage builders would have taken the trouble to clear such an alcove. The alcove may be a place that was never filled with debris, and the rather large hole resulting may have been a factor in the failure of the rock. The quarry marks shown in Figure 53 were found on the east wall of the Mycerinus excavation, just to the left of the part visible in Figure 48. An on-the-spot interpretation (by A. Hassan) indicated that the rock came from a quarry away from the Giza area. These markings were discovered very late in our work in Egypt. Time did not permit the very complete documentation that might aid in understanding the significance of the construction markings. For example, the alignment of the bull's-eye cross and the apparent door indication should be checked against the actual location of the pyramid centerline and the original entranceway. 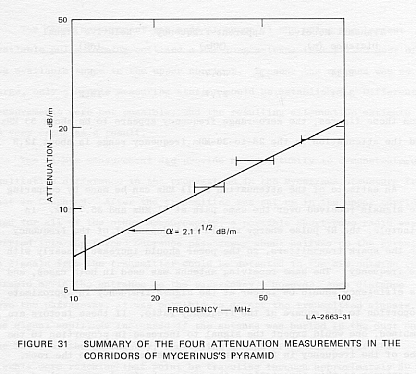 During its autumn 1974 electromagnetic sounder experiments the joint Egyptian-American research team established that high attenuation due to high water content in the limestone of the Giza area precluded many practical applications of radio-frequency sounding for archaeological purposes in that area. This finding was contrary to expectations based on laboratory analyses of samples from the area prior to the trip. In the laboratory tests, high attenuation and sensitivity to humidity were found in only one of three samples sent to us from Egypt. The samples tested before the trip apparently were not entirely typical of the Giza area. Measurements made on the Giza area rocks in situ showed that the attenuation varied from about 6 dB/m at 10 MHz to about 25 dB/m at 150 MHz in approximate proportion to the square root of the test frequency. There was general agreement between the in situ measurements and subsequent laboratory measurements of limestone samples from the Giza area made at a relative humidity close to that inside the pyramid chambers (around 80 percent). Echoes were obtained on one occasion through about 1.6 m of limestone. Success in obtaining echoes on this particular occasion does not indicate too much practical utility of the RF sounding technique in locating unknown chambers because the range of depths that can be probed successfully at any sounder frequency is very limited. If a chamber were known to be at a certain depth--e.g., 2 m--then it might be possible to select a frequency to detect the echo. An error of 0.5 m in estimating the depth, however, probably would cause the echo to be lost either in the strong direct pulse from the transmitter or through attenuation leading to an echo weaker than unwanted clutter signals. Exploration of the pyramids in conjunction with the experiments yielded two interesting results. The first was the discovery of several ancient marks on the recently uncovered stepped construction of the pyramid of Mycerinus and in the forced passage nearby. These marks include both quarry marks and what appear to be alignment markings used as a guide in the building of the finished pyramid. Second, observation of construction practices showed that irregular blocks and debris fill were used far more, particularly in the pyramids of Chephren and Mycerinus, than we thought prior to working at Giza. While such construction practices have been recognized by some Egyptologists, they had not been emphasized enough for their relevance in various types of sounding experiments to be recognized. The recovery of more priceless Egyptian antiquities, let alone the even more important knowledge yet to be gained concerning ancient Egypt civilization, deserves the time, attention, and latest skills of modern science. Yet most archaeology in Egypt continues without benefit of some of the latest scientific techniques. There is often little to guide the archaeologist in his choice of digging sites, and wide-scale surveys of many areas have yet to be made. pressed into the service of archaeology, especially in Egypt. The Radio Physics Laboratory of SRI has been concerned since 1960 with the application of spark switching techniques to the generation of very-high-power impulses.12 Numerous novel transmitters using spark switching have been developed covering the frequency range from 5 MHz to about 150 MHz, and ranging in peak power output from a few kilowatts to more than 50 MW. Many of these transmitters have been used successfully in experimental sounders for ionospheric propagation studies, satellite calibration, and the like. (1) The transmitted pulse had to be very short and free from long-term decay transients (which is the same as requiring the transmitter and antenna to possess large inherent bandwidth). (2) The receiver had to be either well isolated from the transmitter to prevent overload, or have exceptionally good overload recovery characteristics. (3) Transmitting and receiving antennas must couple energy efficiently into the earth, both to improve system efficiency and to avoid as much as possible spurious echoes received through the air from objects on the surface. Selection of the operating frequency for an underground sounding system demands compromises, depending on the particular problem of interest. Because rocks and soil in general attenuate high frequencies more severely than low frequencies, low-frequency signals are indicated for best performance if one wishes to locate scatterers at great depth. The use of low frequencies implies a system with limited bandwidth and, therefore, limited resolution, so that the range to the echo source will be poorly defined. 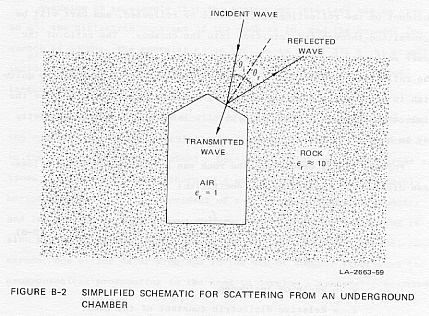 Objects such as underground chambers in a pyramid can also be expected to have smaller scattering cross section at lower frequencies, as shown in Appendix B in a discussion of specular scattering from a hypothetical chamber roof. Several American research organizations have attempted to solve the frequency-selection problem by generating short, unipolar pulses. Such pulses have maximum energy at low frequencies where reasonably small antennas are also notably ineffective. We wanted to radiate a true radio-frequency pulse, with the peak of the spectrum at a useful sounder frequency, such as 25 MHz. Typical spark-switched transmitters built at SRI in the past generate such pulses by discharging energy stored in a resonant circuit tuned to the desired frequency. 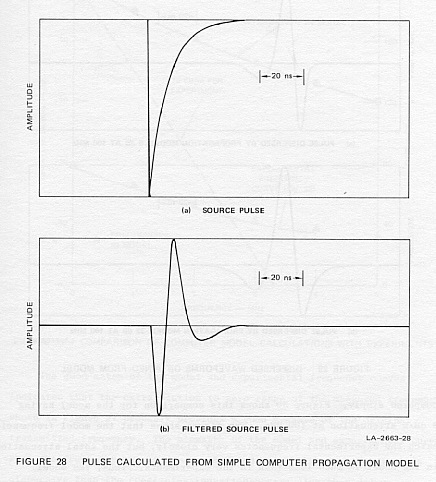 The resulting output pulse represents the combined transient response of the transmitter and antenna, and is characterized by an exponentially decaying envelope following the largest-amplitude part of the impulse. This envelope represents a serious hazard for detecting scattering surfaces close to the sounder. For example, a system with a Q as low as two requires 4.4 cycles to decay by 60 dB from peak amplitude. At 25 MHz, or 40 ns per cycle, the time required for the pulse to reach peak amplitude and decay by 60 ns must almost certainly exceed 200 ns with this kind of transmitter. If the dielectric constant of the rock is ten, this implies that one is unlikely to see objects closer to the sounder than about 30 ft.
To overcome the difficulty imposed by the exponential decay of resonant circuits, SRI built a transmitter based on the design suggested by Hellar and Holter,13 and Samsel.14 This transmitter delivers a single-cycle radio-frequency oscillation to a matched load, with virtually no subsequent ringing. Figure A-1 is a schematic diagram of the sounder. As finally configured, three sounders were built capable of 2 kW, 100 kW, and 1.2 MW peak power output. In the case of the 2-kW, low-power unit, avalanche transistors are used in place of the pressurized spark gap. To give an example, at 25 MHz the single radio-frequency cycle is 40 ns long. If the refractive index of the rock (Öer) is 3.3, then Rm is 6 ft.
Coupling of the radiated electromagnetic energy into the earth is accomplished by using broadband bow-tie or fat dipole antennas similar in shape to those often used for UHF TV reception. Each antenna is sized to match the wavelength in the dielectric medium. They are conveniently made from metal-sprayed cloth or copper screen, and are placed in intimate contact with the ground. Similar bow-ties and broadband dipoles are used for receiving. Resistively loaded wire dipole antennas are also suitable,15 and were used for some of the higher-frequency measurements at Giza. 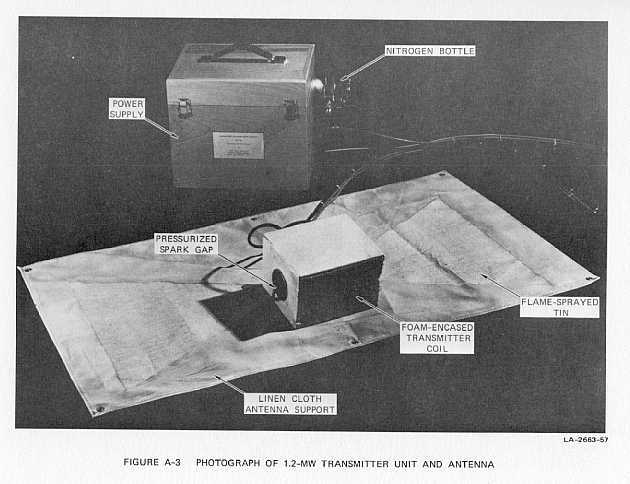 During equipment development, various screening techniques were tried in the attempt to obtain better isolation between transmitting and receiving antennas and to prevent reception of spurious sounder echoes from signals propagated through the air and reflected from nearby objects. Such screening systems adversely affected the system bandwidth, however, and generally proved ineffective in providing isolation. Because the antennas when lying on the ground actually do couple quite effectively into the ground, both the isolation and the spurious echo problem have usually proved less troublesome than anticipated. Subsequent measurements were all made without any isolation screening, and this greatly simplified the equipment. However, as discussed earlier, most, if not all, of the echoes seen with the equipment on the side of Chephren's pyramid appeared to be air-propagated reflections. The sounder display found most useful for our purposes, the A-scope or amplitude-versus-time oscilloscope presentation, is the simplest that allows real-time inspection of the field of view of the sounder and monitoring of performance at the same time. Other presentations have been used in other applications of the sounder. Figure A-2 shows a typical receiving antenna, and Figure A-3, the 1.2-MW transmitter unit and antenna. The equipment is entirely battery-powered; however, a small gasoline generator has proved as convenient as the large battery pack required by the oscilloscope. This equation is plotted in Figure B-1(a). A plot of this equation is shown in Figure B-1(b). More simply, the total system loss is the sum of the geometrical loss in decibels and the absorptive loss in decibels. To illustrate, practical subsurface electromagnetic sounding systems that can be built almost always have a total available dynamic range below 150 dB (more typically, 100 dB when clutter-limited), so that one can hope to detect a target only if the total system loss is below approximately 150 dB. Since geometrical spreading losses will often be 30 to 50 dB (see Figure B-1), this implies that absorptive losses must be less than 100 to 120 dB for echoes to be detected when all else is favorable. Thus, for purposes of comparing various media, the attenuation factor, a, is more conveniently expressed in terms of dB/ft or dB/m. In a medium where a = 1 dB/m, one can hope to detect targets if R < 50 m (when clutter-limited). Tan d is the dissipation factor of the medium or the reciprocal of the quality factor, Q.
where f, the frequency, is in megahertz, and tan d » (18/fer)s, with s being the conductivity of the medium in millimho/m. The variation of either absorptive loss or relative dielectric constant with frequency causes dispersion of a short pulse propagating through a rock medium. Dispersion means that the form or shape of the pulse has been altered in the process of propagation because a pulse is composed of a "band" of frequency components that are not all equally attenuated by the medium. In addition, in rocks and soils the relative dielectric constant usually varies with frequency (especially when attenuation rates are high). The parameter that best describes the scatterer (the chamber or void to be detected) is its scattering cross section, å. This parameter is dependent on a matrix of variables including the physical area of the scatterer, the shape of the scattering surface, the orientation of the scatter with respect to the transmitter and receiver, the reflectivity of the scattering surface, and the incident wavelength of the probing energy. In general, a large geometrical area of the scatterer also corresponds to a large scattering cross section. One exception to this general rule is that objects in the "resonance region" where the operating wavelength is comparable to the dimensions of the scattering object can have cross sections much different than the target's physical size would suggest. The exact prediction of cross section of objects of various shapes from theory is possible for only a limited number of simple cases such as spheres, cylinders, and flat plates. Objects with more complex shapes are normally modeled and the scattering pattern experimentally determined on an antenna range. At least to first order, the specular cross section is independent of the scattering angles qi and qr. Figure B-2 also indicates that, in general, part of the power incident on the reflecting surface will be reflected, and part will be transmitted through the interface into the chamber. The ratio of the power reflected to the power incident on unit area of the surface is the reflection coefficient, r. This reflection coefficient can be quite high in practical situations involving a rock/air interface because the dielectric constant of rock is typically large and/or the conductivity may be high. The plus sign in the coefficient applies where the incident electric field is parallel to the scattering interface, and the minus sign applies where the magnetic field of the incident wave is parallel to the interface. If the rock has a dielectric constant of 10, the critical angle is only about 18°. Thus, if qi is larger than 18°, the rock/air interface scatters as efficiently as a metal plate of the same size and shape. Even at normal incidence, r = 0.27 for a dielectric constant of 10, so the scattering efficiency is reduced only about 6 dB in this case. Assuming as an example that the scattering interface has an area of 50 m2, the dielectric constant of the rock is 10, and the sounder frequency is 20 MHz, the specular cross section is about 375 m2 at normal incidence and 1400 m2 for any geometry with the angle of incidence larger than 18°. Archaeological chambers are often built with flat surfaces so that the specular scattering calculations assume a particular significance in the search for these chambers. Because specular scattering cross sections are extremely large, there is a good chance of detecting deeply buried chambers given the accident of a favorable scattering geometry and low RF loss in the medium. However, since specular scattering is also highly directive if the scattering surface is several Fresnel zones across, one of the major problems in the use of sounder techniques for archaeological prospecting is the need to develop a systematic search technique to assure that a nearly specular geometry is obtained for all likely chamber orientations within the search volume. In addition to dispersion, the geometry of large scattering surfaces can also affect the shape of received echo pulses in ways that can be difficult to interpret. If the scatterer is quite large, as in the case with the mine chambers used in the sounder feasibility experiments, there is a possibility that both rough surfaces of large area and separated specular surface spaces will be seen too closely in range to be clearly resolved. Each of these effects results in a reflected pulse that is longer than the original transmitted pulse and also in a more complicated received waveshape. 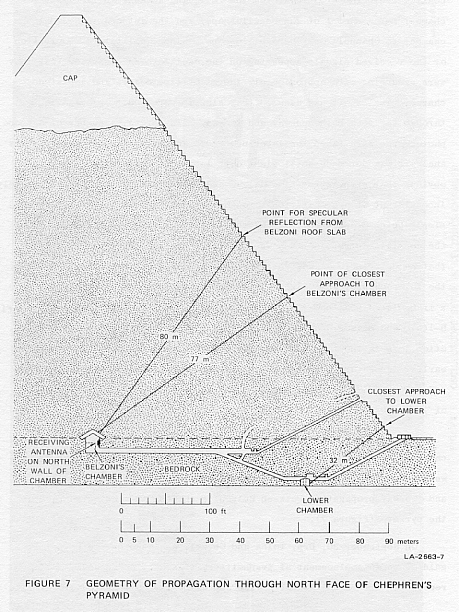 As an example of such problems of "range depth of targets," consider the geometry illustrated in Figure B-3. Suppose the target is a chamber or void presenting a scattering surface extended in range as shown in Figure B-3. Along the length of such a chamber, for instance, there may be many small segments of the surface that are specular reflectors for the geometry illustrated, but there is no single, large area that will give a dominant specular reflection. Thus, while the incident transmitted pulse may everywhere be but one RF cycle in length, the scattered signal reaching the receiver will be a composite pulse longer than one cycle. This echo signal will consist of the vector sum of contributions from glints and scattering points along the whole distance AB in Figure B-3. From the receiver one observes that the initial pulse has been changed in form and also "stretched" in time by an amount proportional to the path differences (P2-P1). When scattering from an extended target occurs, because the components of the echo combine randomly, the total scattering cross section increases linearly with the scattering area, rather than as the square of the area, as with specular reflection. This means that the echo amplitude that can be expected to be returned from rough, extended surfaces is significantly smaller than from specular surfaces. Because the greater pyramids are built of 2 to 3 million limestone blocks, it is important to at least raise the question of scattering of electromagnetic energy at the joints between the blocks. Fortunately, classical electromagnetic theory predicts the losses at the joints will be small if the joint spacing is very small compared to a wavelength. However, the periodic, regular recurrence of such joints could produce internal scattering in the pyramid resembling Bragg scattering. While the interior construction of the pyramids is much more crude than the outer layers, most of the joints inside appear to be mortar-filled. Since the dielectric constant of this mortar is close to that of limestone, the dielectric constant across a limestone-mortar-limestone joint is small compared to that across a limestone-air-limestone joint. Thus, scattering at the joints would be reduced even further. Two hand specimens of Giza limestone (designated G1 and G2) of Eocene (?) age were examined megascopically and found to be significantly different in texture and fossil content. Mineralogical characterization of these two limestones was accomplished using a binocular microscope, powder x-ray diffraction and emission spectrographic analysis. Microscopic study of several chips of G1 at 70X magnification showed it to be a bioclastic limestone containing numerous gastropod and brachiopod casts and oolites set in a dense matrix ranging from microcrystalline to sparry calcite. The matrix is cut by numerous holes and tubular channels possibly produced by burrowing organisms in a microcrystalline calcite ooze. Following R.L. Folk's (1961) classification of limestones, G1 can be designated a microcrystalline allochemical limestone (Type II) which probably formed in an aqueous environment of weak, short-lived currents and/or a rapid rate of precipitation of microcrystalline ooze. Here the allochem material consists of intraclasts of penecontemporaneous microcrystalline limestone; slender, high spired gastropods (possibly Terebra) and brachiopod fragments that have since been leached away; and oolites up to several mm in diameter showing concentric structure. Some of the vugs that were produced by the leaching of fossil shells and by the burrowing of organisms contain crystals of authigenic calcite up to 0.5 mm in diameter. A similar examination of several small chips of G2 at 70X magnification showed it to be an aphanitic limestone devoid of fossil material (at this level of detection). It can be designated a microcrystalline (Type III) limestone according to Folk's classification scheme implying that it formed at a rapid rate of precipitation in an environment lacking strong currents. Samples of G1 and G2 were crushed to roughly 300 mesh and mounted by acetone slurry on glass slides. An x-ray spectrum of each sample was recorded by continuous scanning at a speed of 1/2° 2q/min using Ni-filtered Cu Ka radiation and a scintillation detector mounted on a Phillips goniometer. Each sample yielded an X-ray spectrum consistent with that of calcite. The spectrum of sample G2 showed a very weak peak at d = 2.88Å suggesting the presence of a small amount of dolomite. In order to concentrate other possible phases in the limestone relative to calcite, approximately 15 grams of crushed samples of G1 and G2 were digested in 10% acetic acid for two hours. Dilute acetic acid was chosen so that any phosphate or clay mineral present would be unaffected by acid digestion. The resulting undigested residues were filtered and dried, yielding roughly 3.6 grams of G1 and about 4.7 grams of G2. Slurries of these residues were prepared as above and a second x-ray spectrum of G1 and G2 was recorded. G1 showed only calcite reflections as in the previous spectrum; however, the new spectrum of G2 showed a number of additional reflections in the 2q range 5 to 15° indicating d-spacings from 15 to 5 Å. These new reflections clearly represent additional phases which are tentatively identified as the clay minerals kaolinite and montmorillonite. A small amount of quartz was also detected. The d-spacings, relative intensities and assignments of reflections other than those due to calcite are listed in Table 1. Unambiguous assignments are impossible for five reflections. It should be emphasized that the assignments in Table 1 are tentative due to the weakness and number of extra reflections that are present. However, the presence of a small clay fraction in G2 is unequivocal. The results of a semi-quantitative emission spectrographic analysis of samples G1 and G2, performed by Dr. C.M. Taylor of the Geology Department at Stanford on a Jarrell-Ash Spectrograph are listed on the following page. Ca is the major constituent. Only Si, Mg, Al, Sr and Na are present in amounts greater than 0.1% by weight. The low level of each of these elements is consistent with the petrographic and x-ray analysis of sample G1 which indicated it to be essentially pure calcite. As expected, Ca is abundantly present. Si (3-5%) is present in quartz and clay minerals. Mg (1-2%) is present in dolomite as is the Sr (0.3-0.5%). Al (0.3-0.5%) and Na (0.2-0.3%) are presumably present in clay minerals. These chemical data are consistent with the mineralogical findings. Petrographic, x-ray and chemical study of two samples of Giza limestone (G1 and G2) has shown that G1 is an essentially pure calcite microcrystalline allochemical limestone containing intraclasts of microcrystalline limestone, casts of gastropods and fragmented brachiopods and concentrically banded oolites up to several mm in diameter. Numerous vugs contain authigenic calcite crystals up to 0.5 mm in diameter. G2 was found to be a non-fossiliferous microcrystalline limestone containing roughly 3% or less dolomite [MgCa(CO3)2], quartz [SiO2] and clay minerals (possibly kaolinite [Al2(Si2O5)(OH)4] and montmorillonite [(Mg,Ca)Al2Si(Si4O10)(OH)8]). The mineralogy of G1 and G2 as derived from powder x-ray examination is supported by the emission spectrographic analysis. 1. 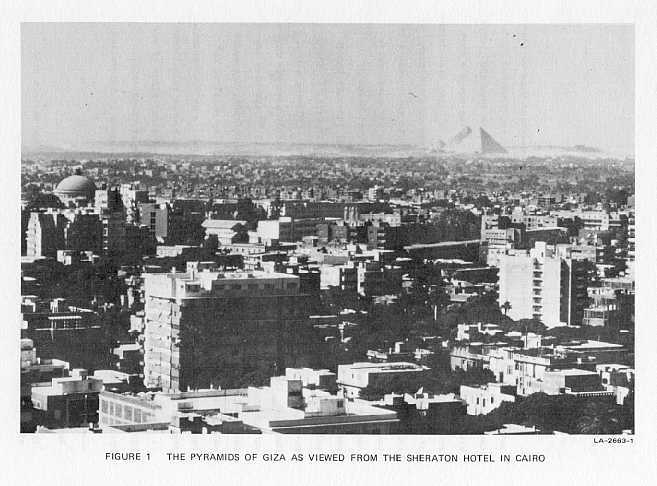 A. Fakhry, The Pyramids (University of Chicago Press, Chicago, 1974). 2. Selim Hassan, Excavations at Giza (Cairo, 1934). 3. L. W. Alvarez, "One Researcher's Personal Account," Adventures in Experimental Physics (World Science Communications, Princeton, New Jersey, 1972). 4. 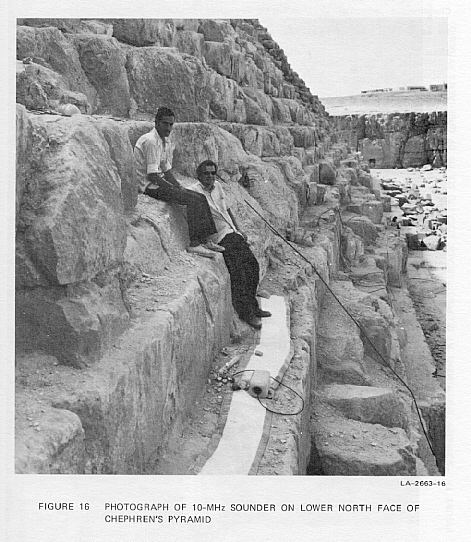 L. W. Alvarez et al., "Search for Hidden Chambers in the Pyramids," Science, Vol. 167, pp. 832-839 (6 February 1970). 5. G. Alexander, "No Secret Room Found in Pyramid," The Los Angeles Times (April 22, 1974). 6. L. T. Dolphin, R. L. Bollen, and G. N. Oetzel, "An Underground Electromagnetic Sounder Experiment," Geophysics, Vol. 39, No. 1 (February 1974). 7. 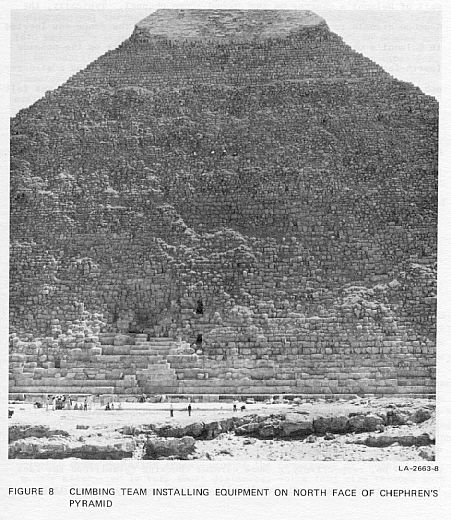 P. Tompkins, Secrets of the Great Pyramid (Harper & Row, San Francisco and New York City, 1971). 8. I.E.S. Edwards, The Pyramids of Egypt (Penguin Books, Harmondsworth, Middlesex, England, 1947, Rev. 1961). 9. K. Mendelssohn, "A Scientist Looks at the Pyramids," American Scientist, Vol. 59, pp. 210-220 (1971). 10. K. Mendelssohn, "The Riddle of the Pyramids" (Thames and Hudson, Cambridge, England, 1974). 11. A. Hassan, "Hieroglyphic Inscriptions on the Third Pyramid." In press. 12. K. Landecker and K. S. Imrie, "A Novel Type of High Power Pulse Transmitter," Australian J. Phys., Vol. 13, p. 638 (1960). 13. M. W. Hellar, Jr., and W. G. Holter, "A Transmission Line Oscillatory Pulse Generator," Proc. Nat. Electronics Conf., Vol. IX, National Electronics Conference, Inc., Chicago, 1954. 14. R. W. Samsel, "Pulse Generator," U.S. Patent No. 2,792,508 (1967). 15. G. C. Rose and R. S. Vickers, "Calculated and Experimental Response of Resistively Loaded V Antennas to Impulsive Excitation," Int. J. Electronics, Vol. 37, No. 2, pp. 261-271 (1974).